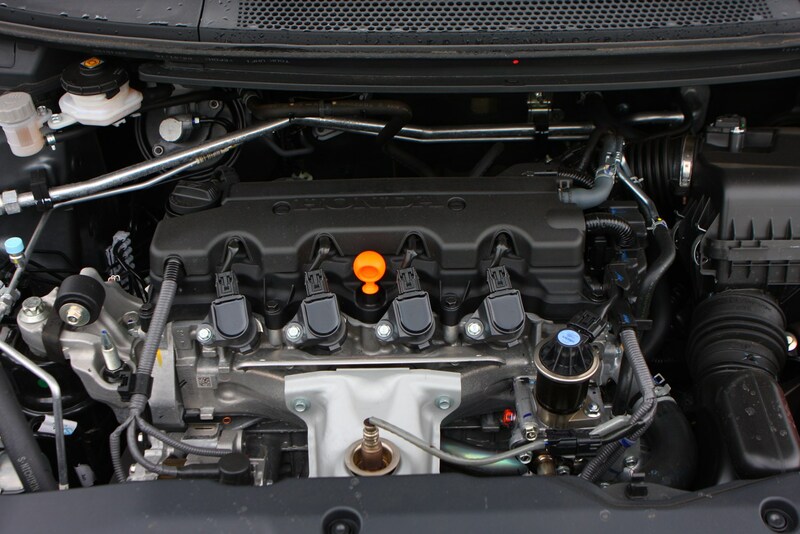 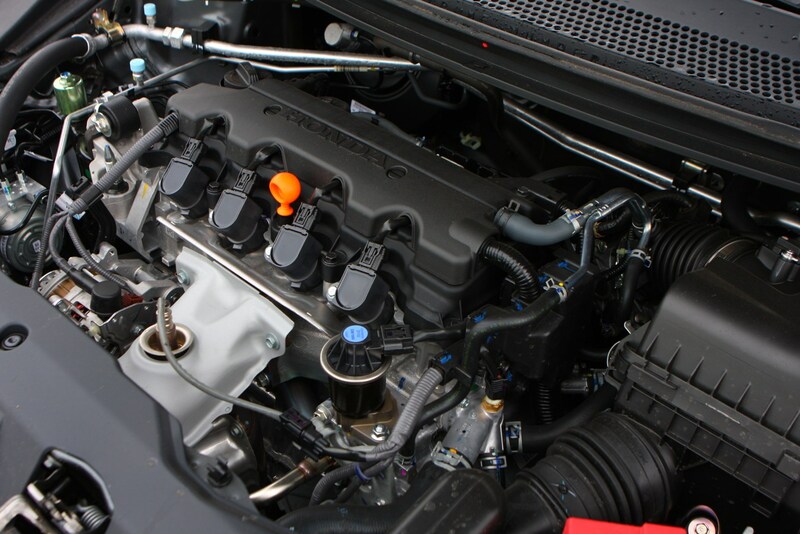 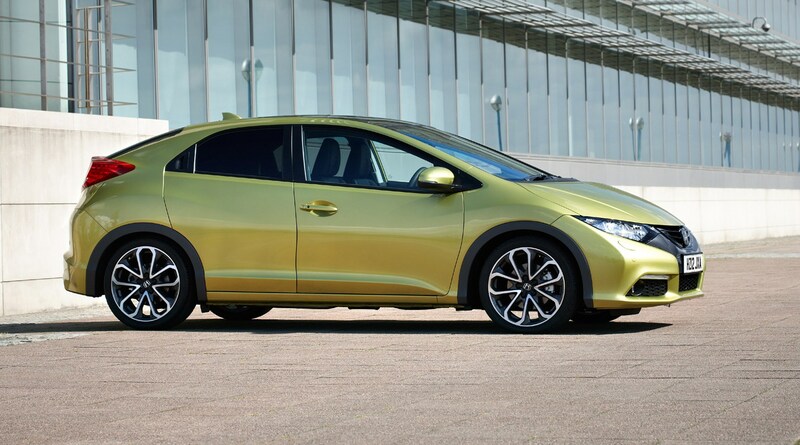 From launch there were three engines to choose from: 1.4-litre and 1.8-litre petrols and a 2.2-litre diesel, with the latter phased out in 2014 by a 1.6-litre diesel. 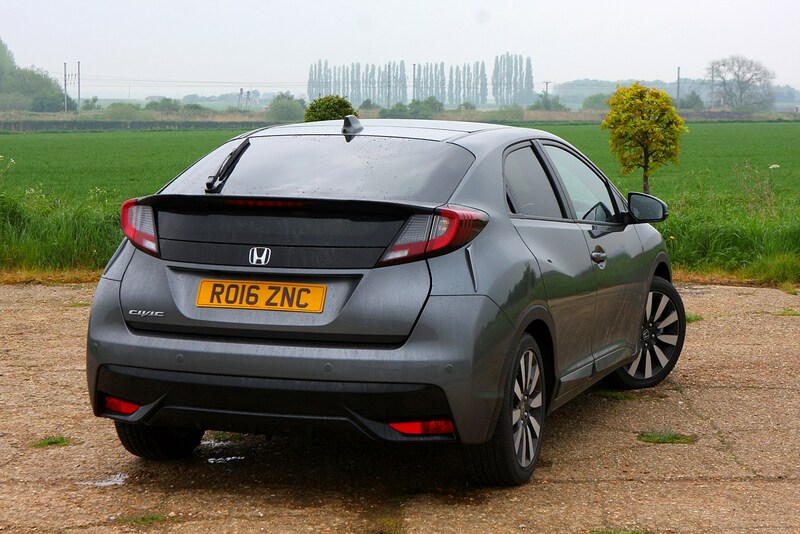 The entry level 1.4-litre 99bhp petrol is fundamentally disappointing in terms of performance: the 0-62mph time of 13.4 seconds tells half of a fairly uninspiring story. 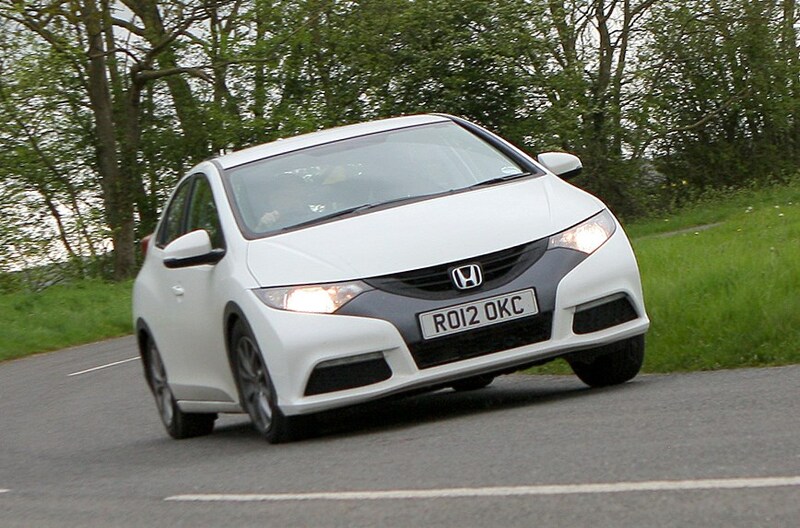 In reality it labours up hills and it needs way too much coaxing and downshifting to get it up to speed. 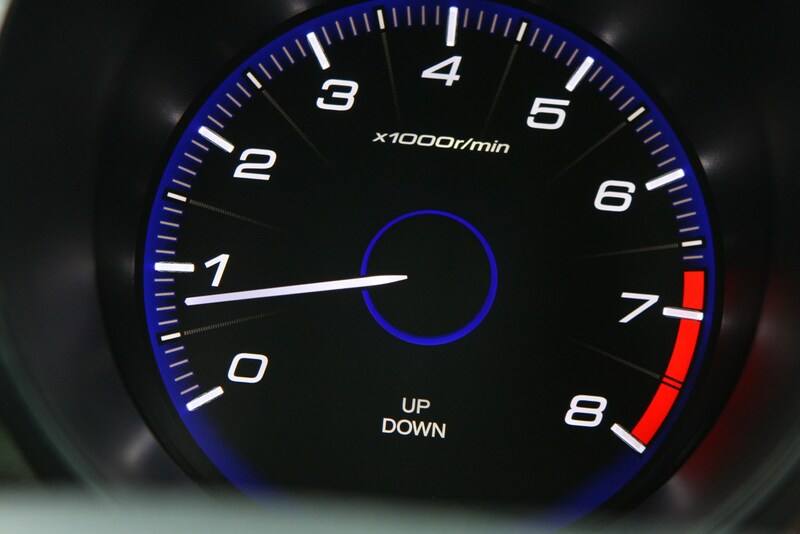 If you persist you'll reach a top speed of 116mph, but it's not much fun while you are getting there. 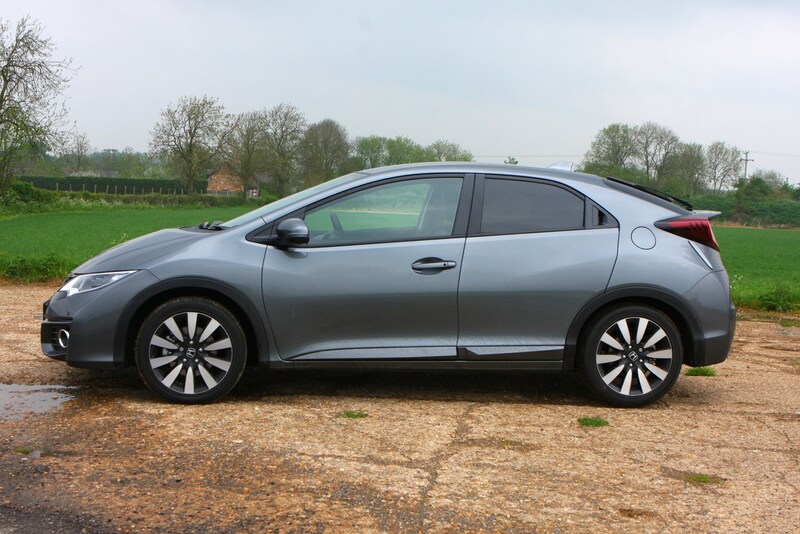 The 140bhp 1.8-litre is a more practical choice if you are dead set on purchasing a petrol-powered car but it's not very urgent and you'll get better from lesser-powered offerings in the Volkswagen Golf and Ford Focus range. 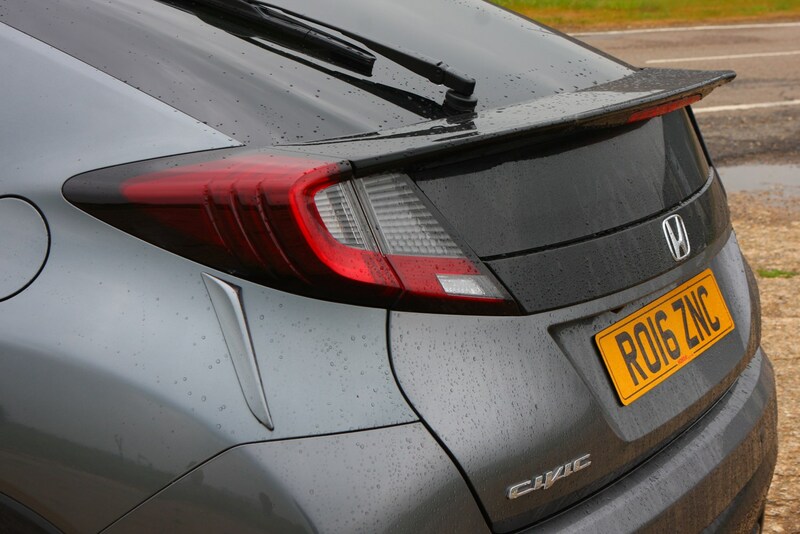 For the record you'll get from a standstill to 62mph in a fairly creditable 9.1 seconds if you have a six-speed manual, and then achieve a top speed of 130mph, but we still found it running out of breath when we were going uphill. 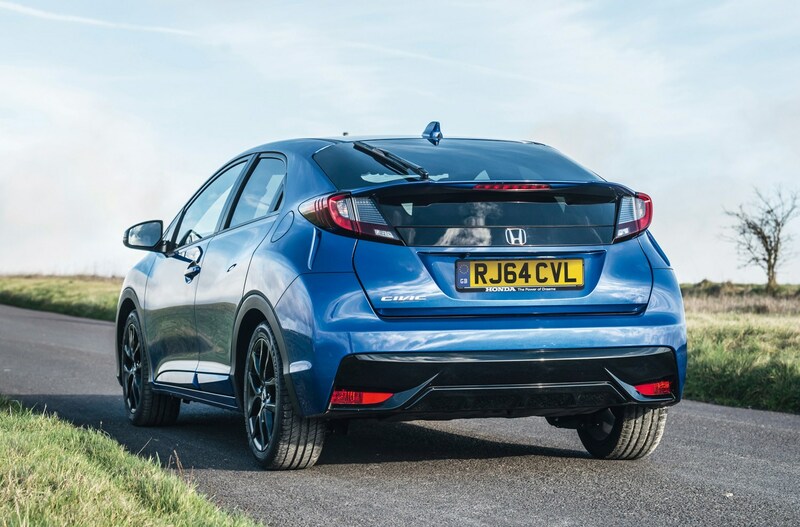 The auto seems pointless - it'll take you 10.9s to get to 62mph, which is almost two seconds slower than the manual, and if you go for the GT with the bodykit you get to the same speed in even tardier 11.5s. 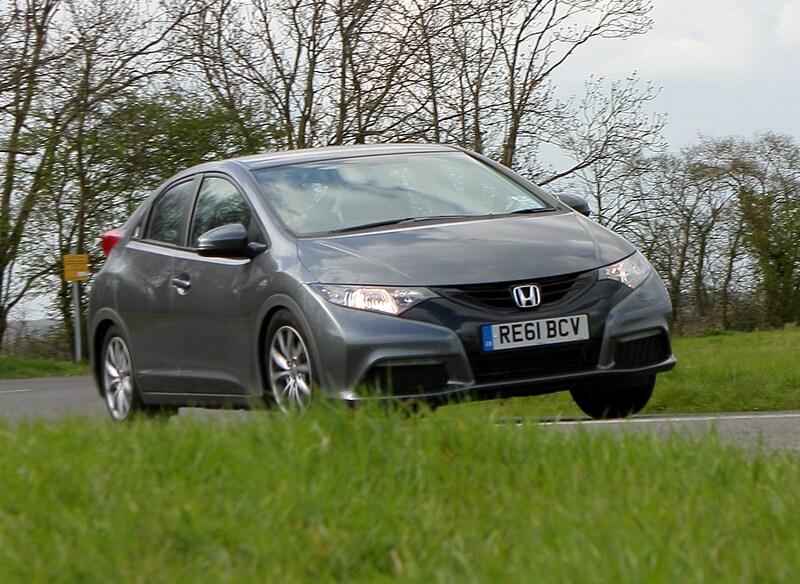 The 148bhp 2.2-litre had typical diesel low-down pull for around-town driving and suitably chunky shove for overtaking on B-roads. 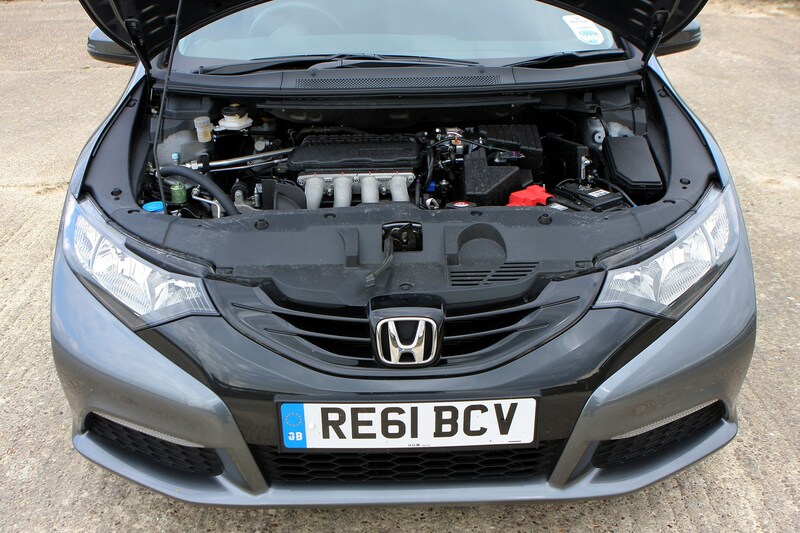 It would do 135mph and took just 8.5s to get to 62mph, and was phased out by a smaller 1.6-litre unit. 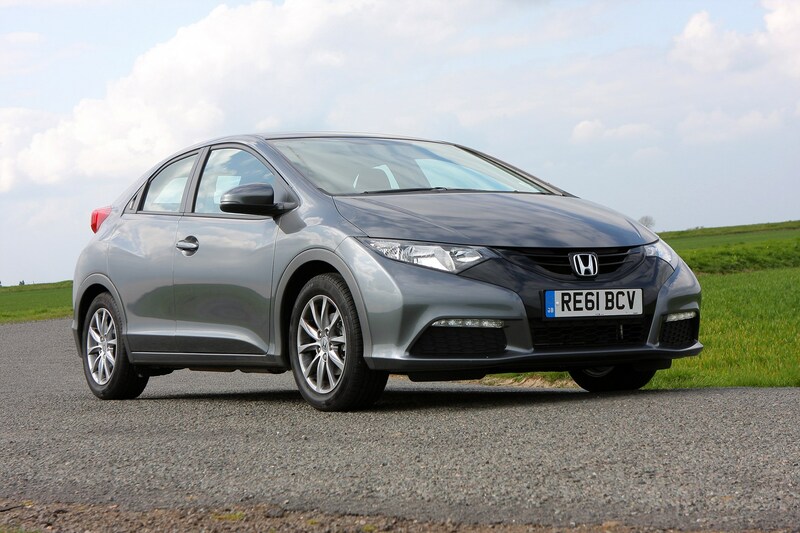 The smaller and newer 1.6-litre diesel is hard to argue against as the most sensible choice, however – it offers an excellent mix of performance and economy. 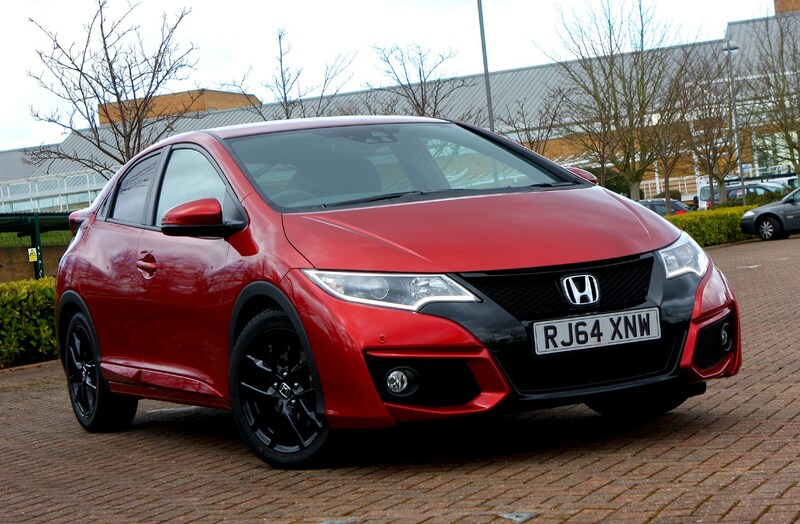 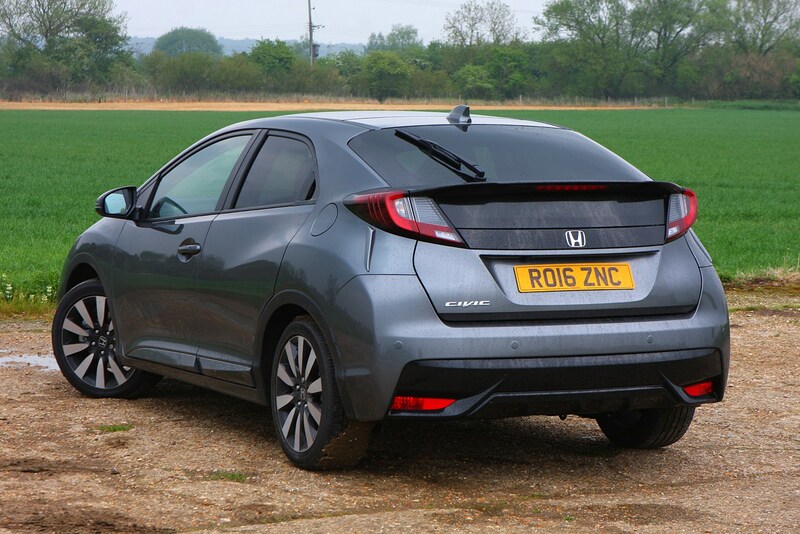 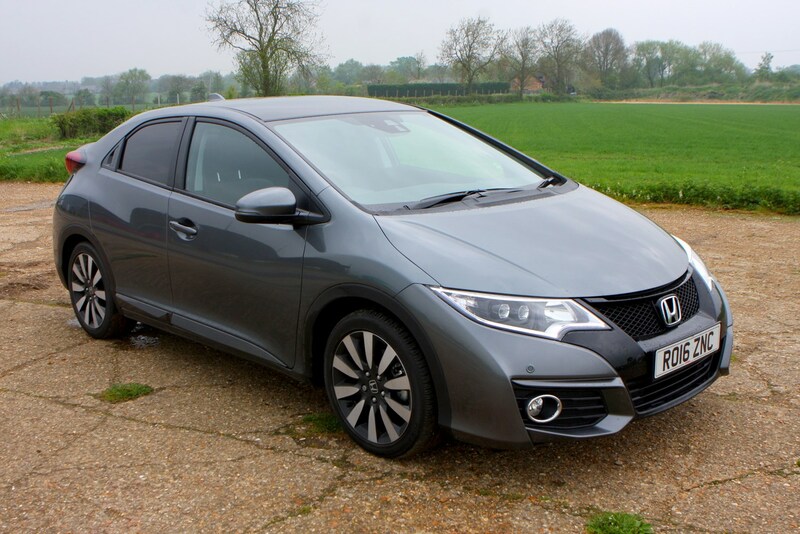 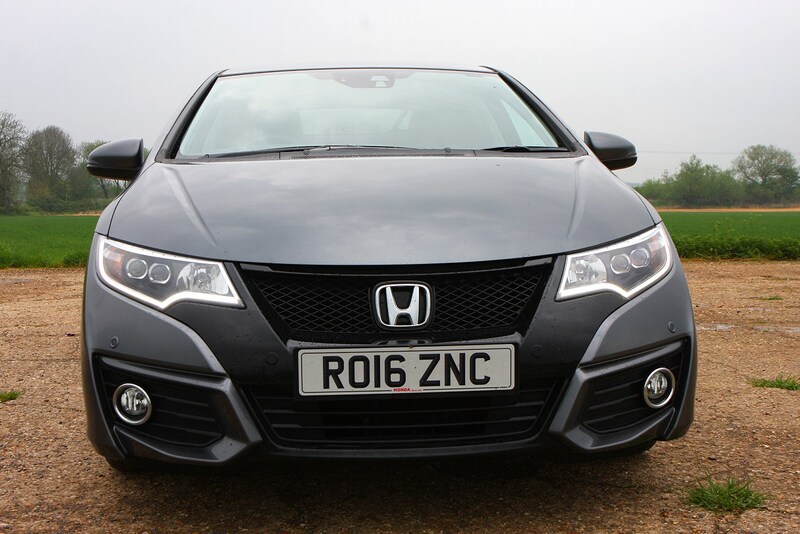 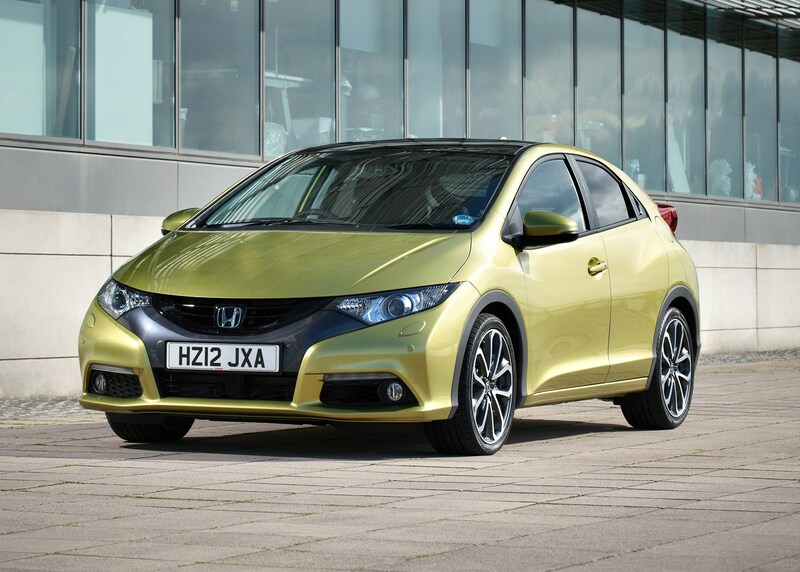 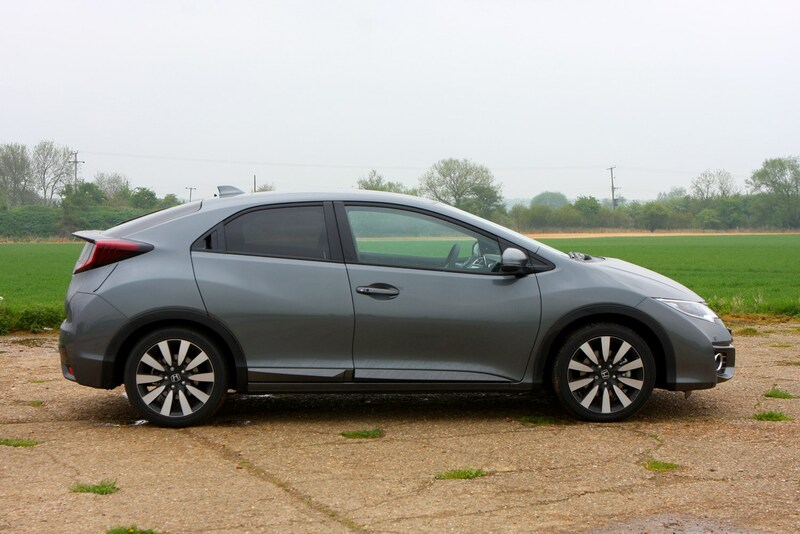 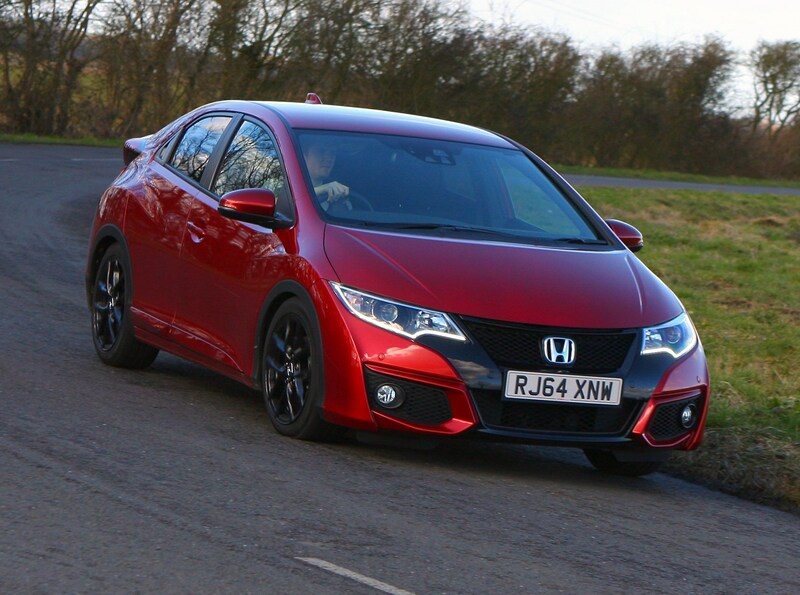 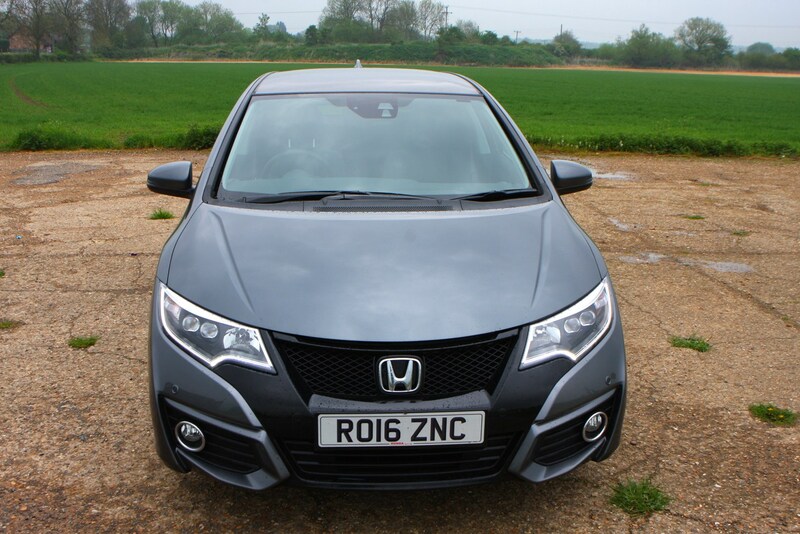 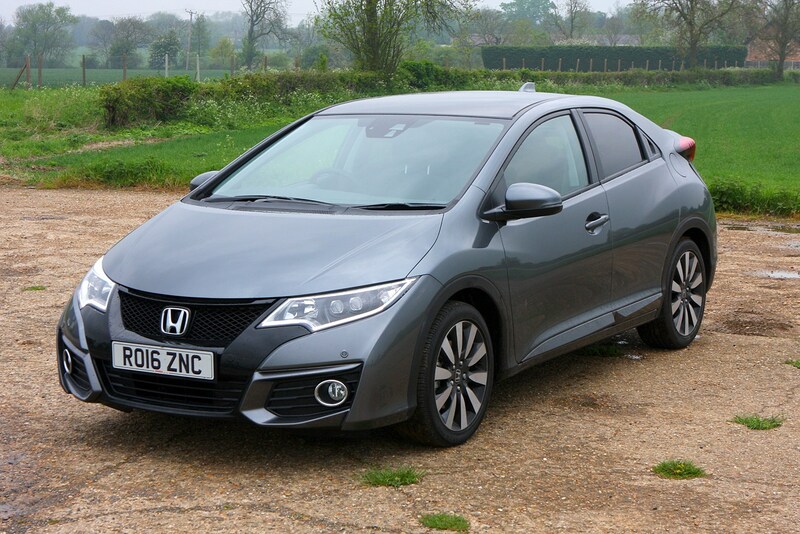 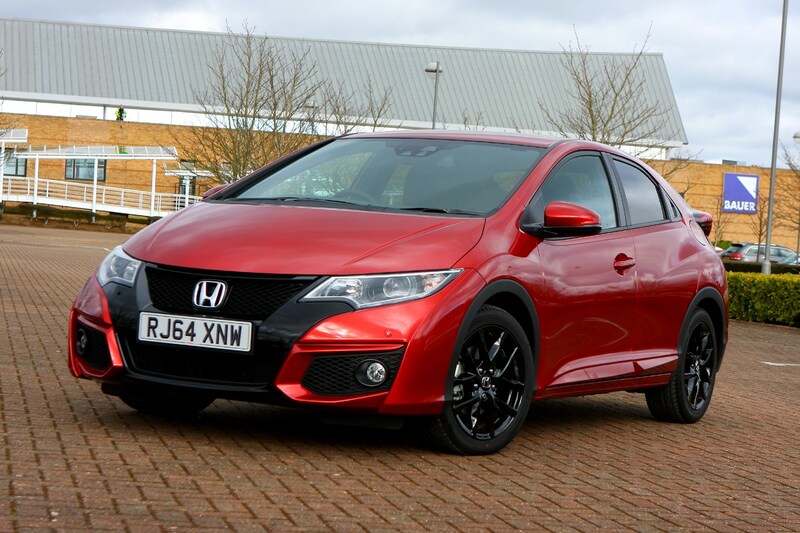 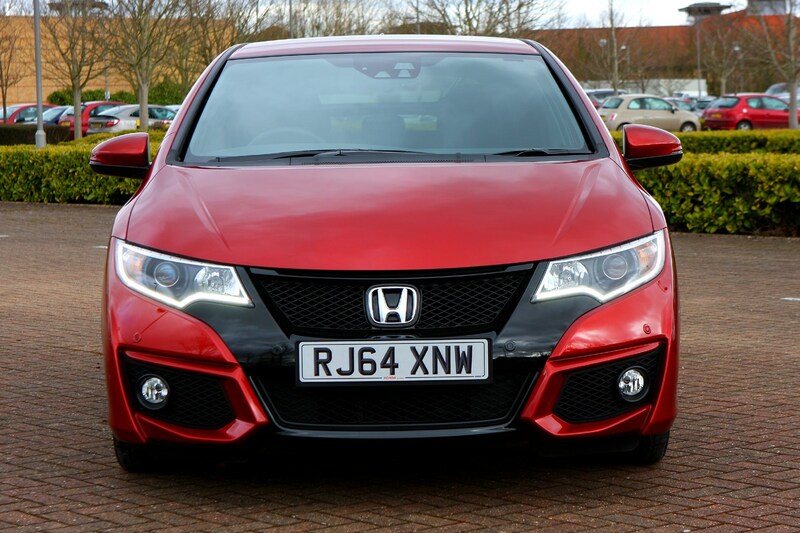 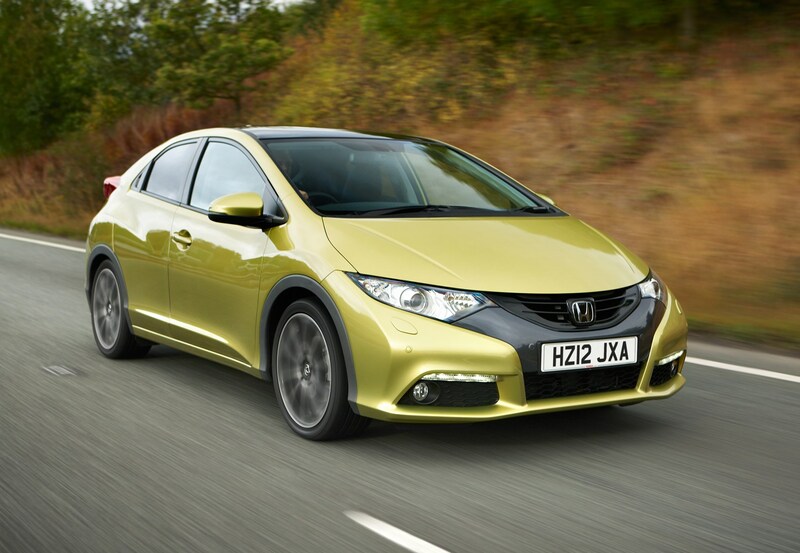 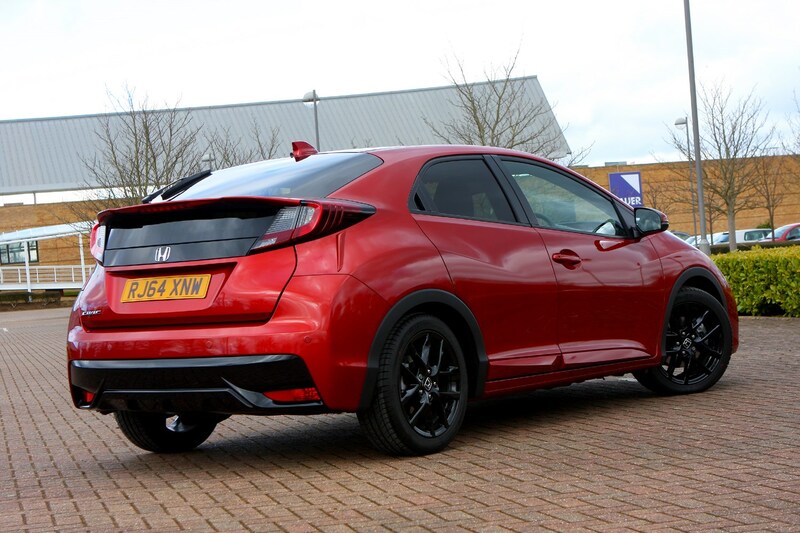 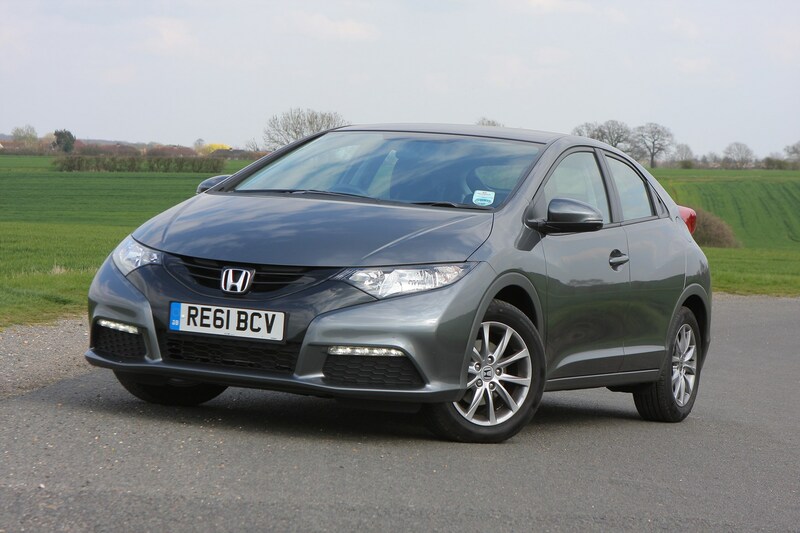 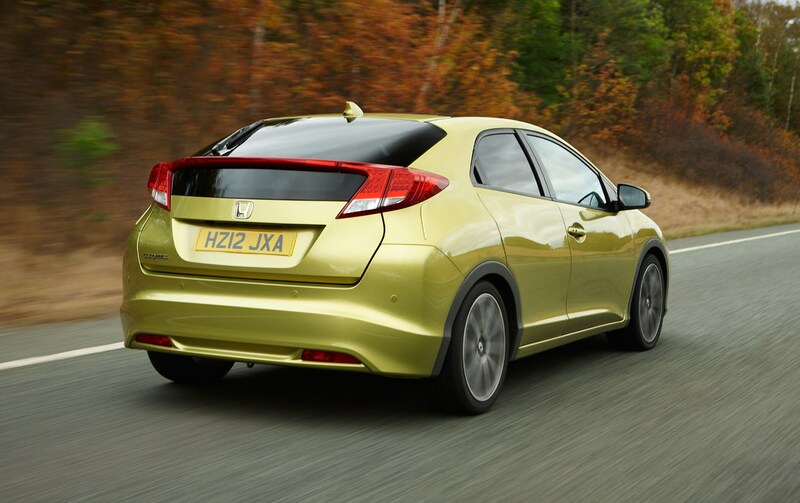 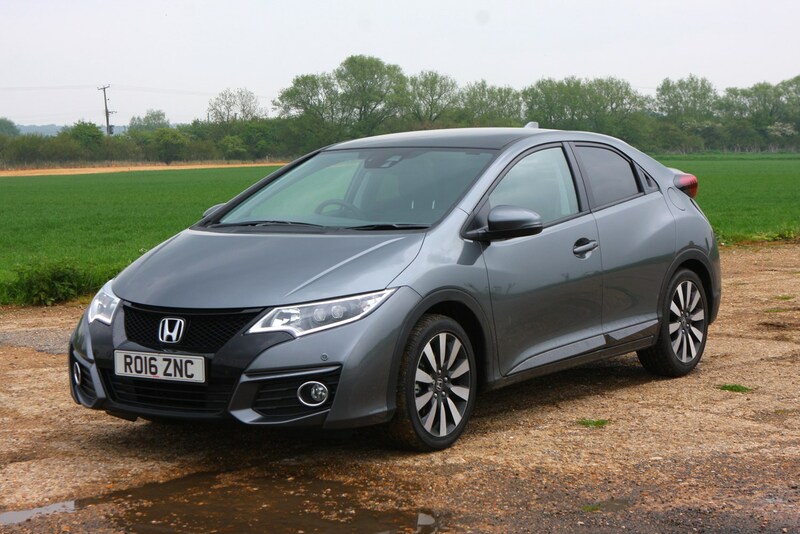 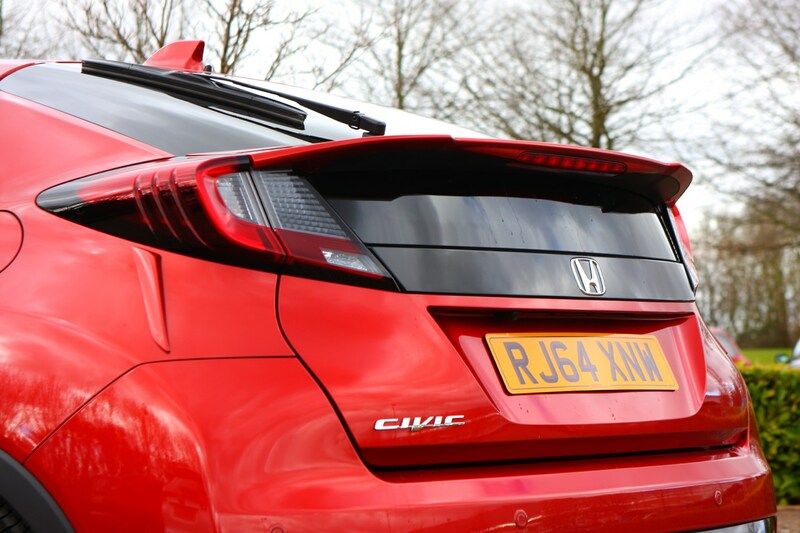 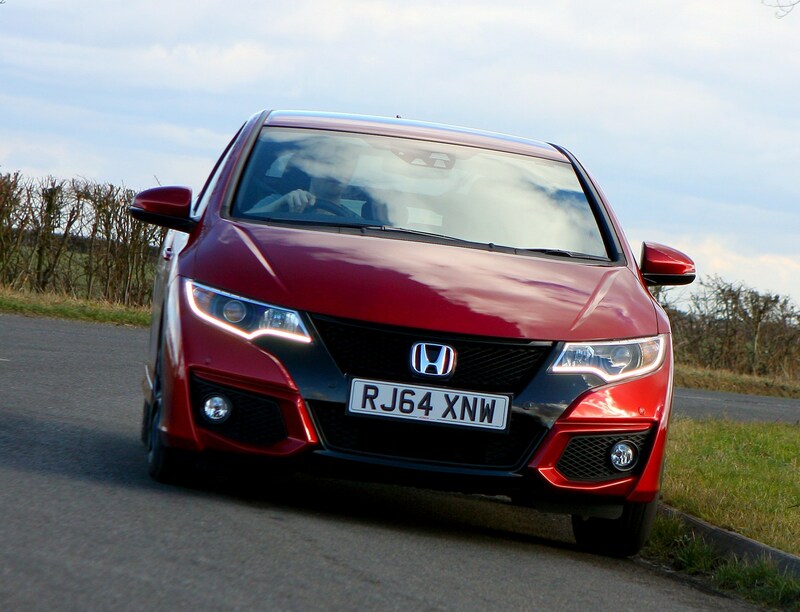 Putting out 118bhp, it’ll take the Civic from 0-60mph in 10.2 seconds and on to a top speed of 129mph, while attaining excellent fuel consumption and emissions figures – more on which in the ‘Costs’ section of this review. 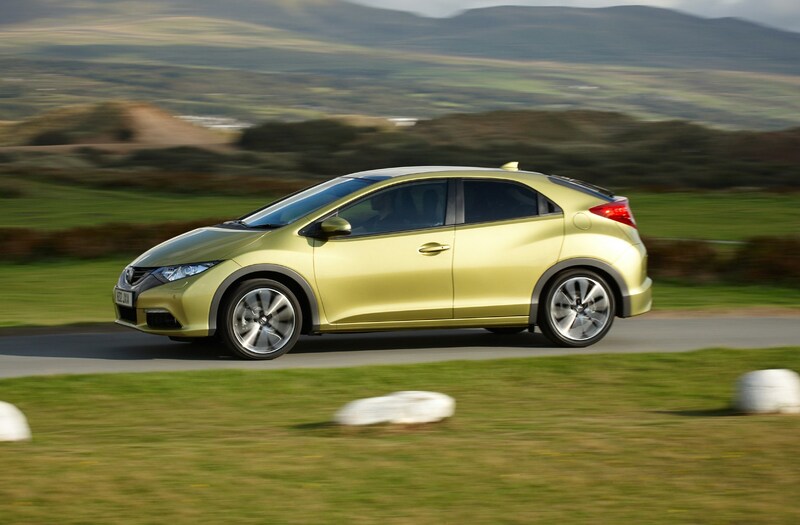 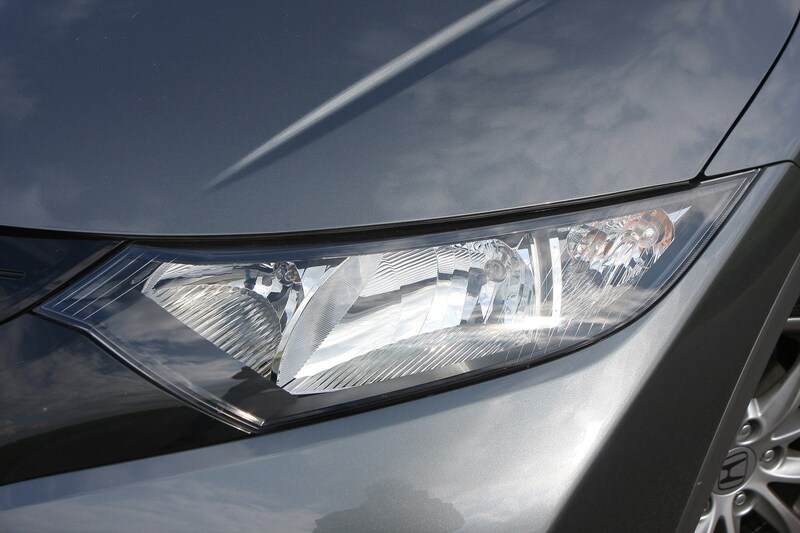 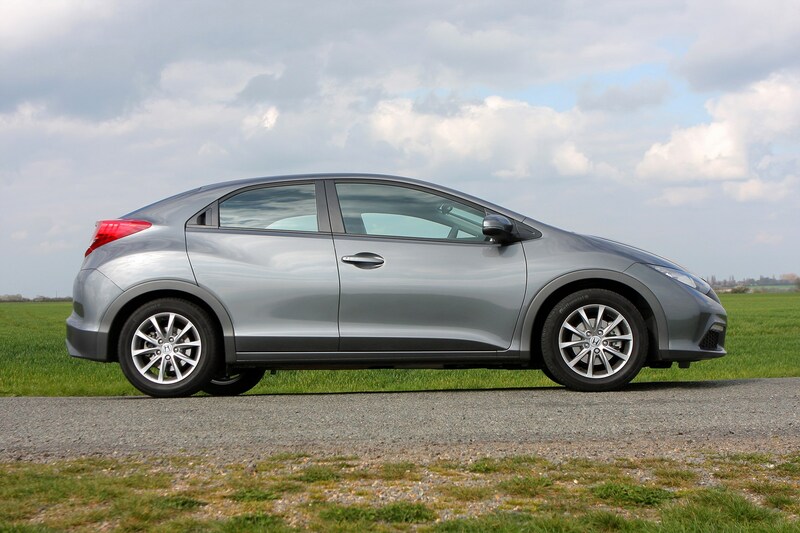 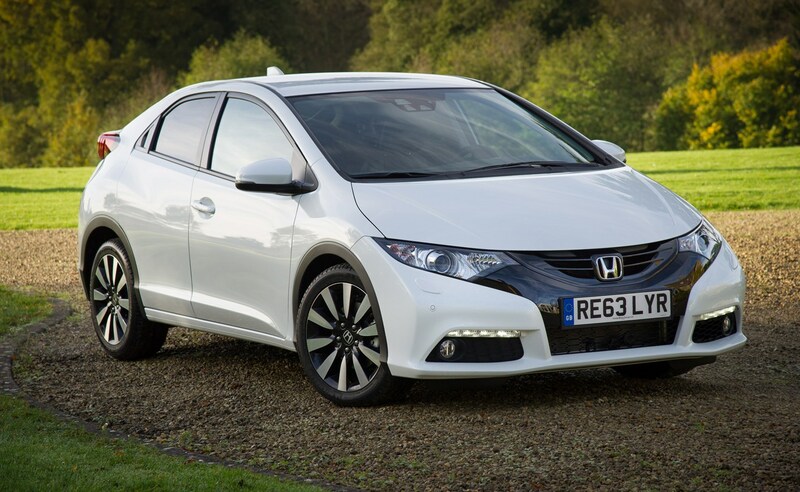 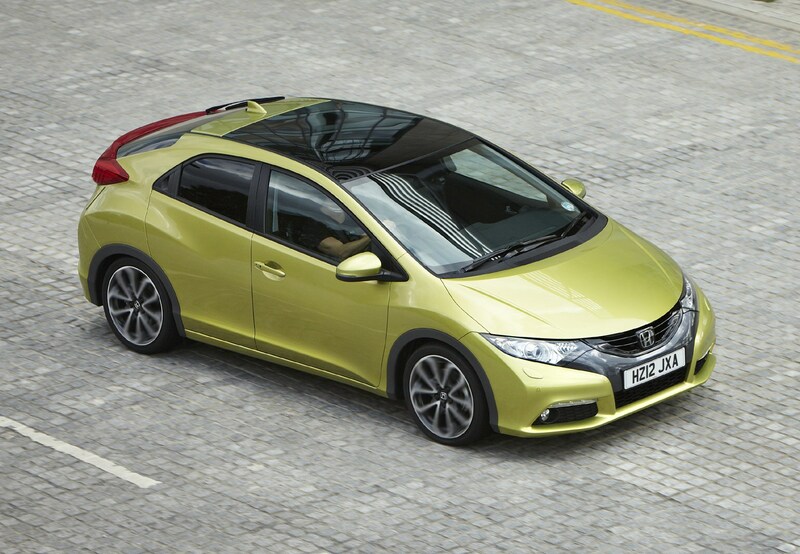 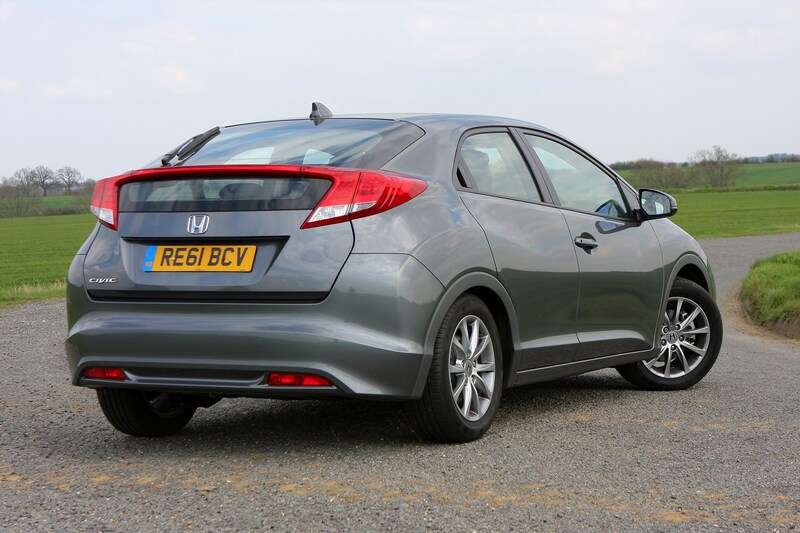 The previous-generation Civic was decent around corners but not quite class-leading. 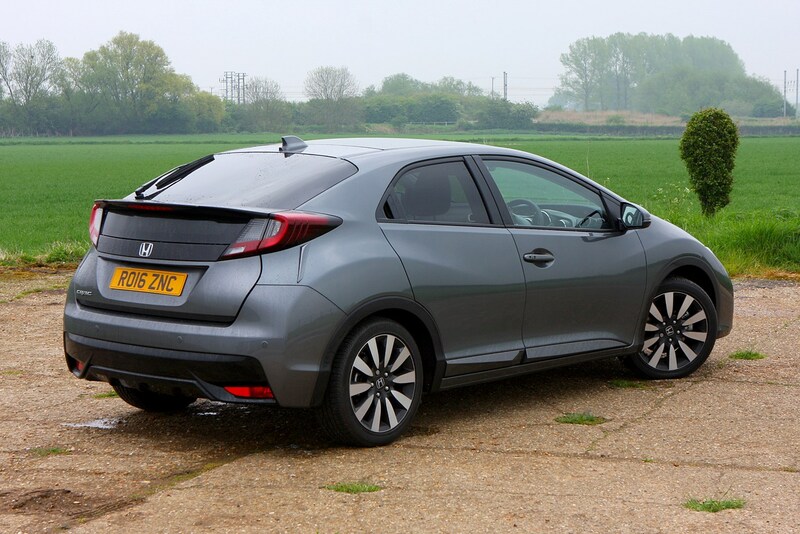 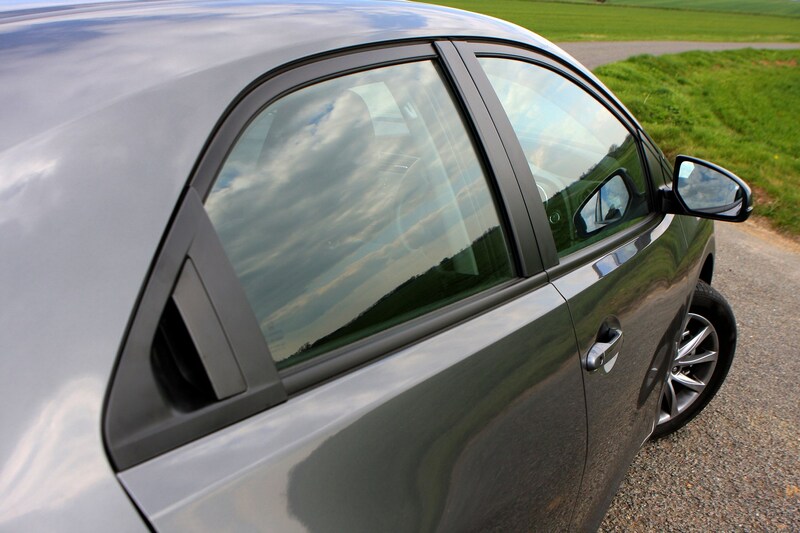 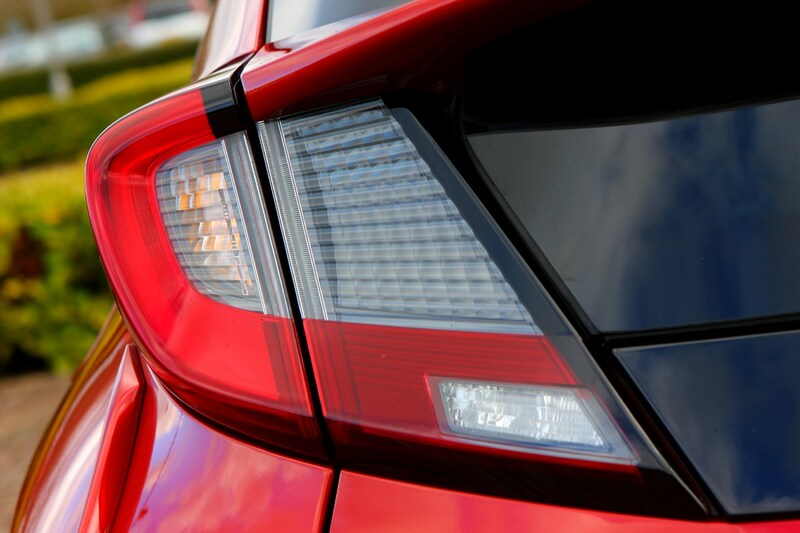 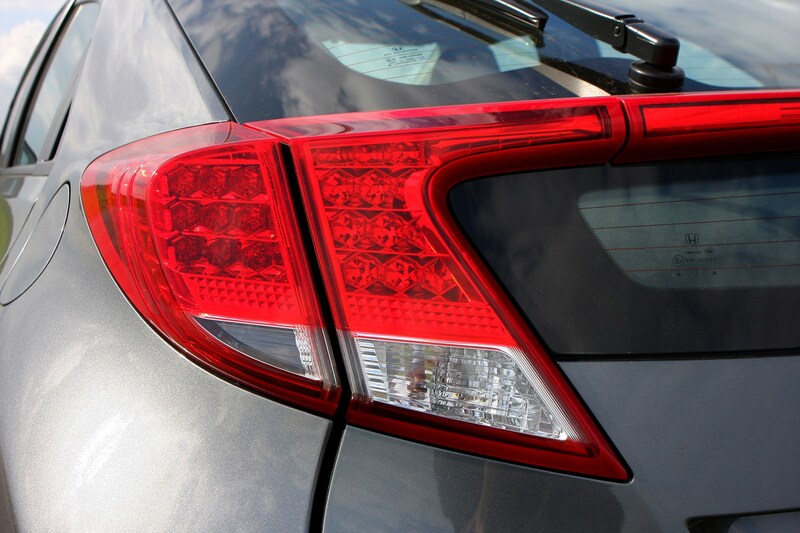 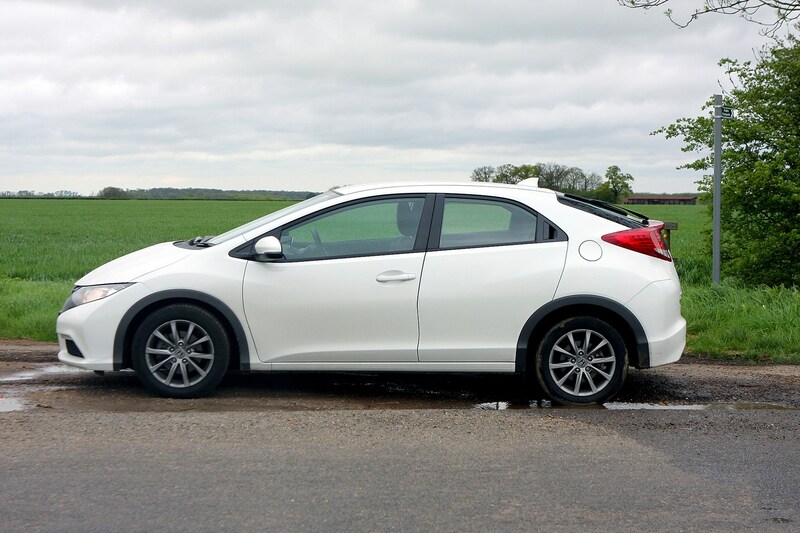 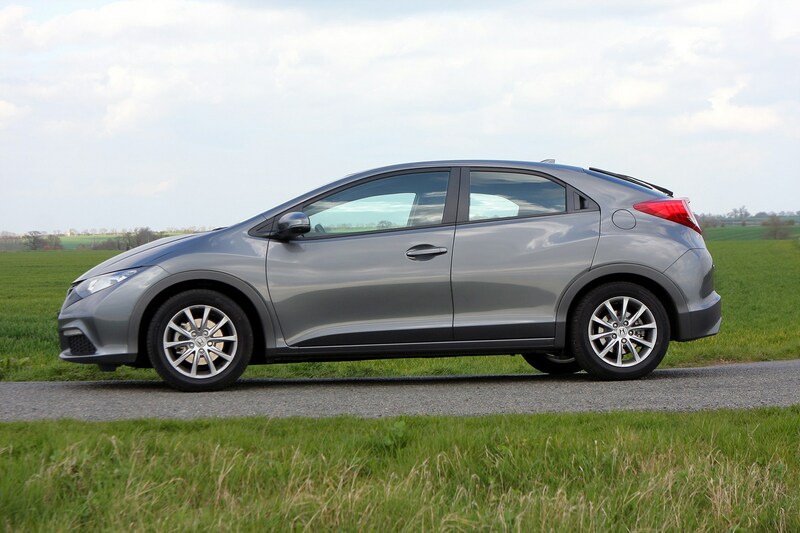 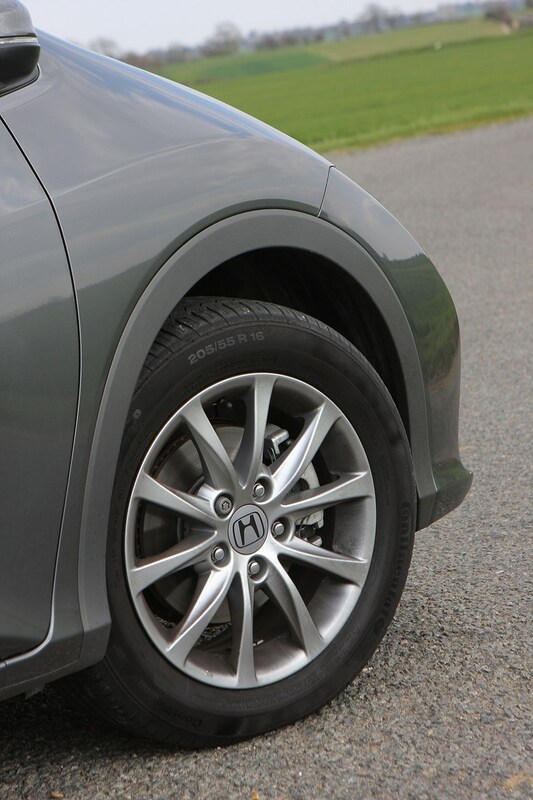 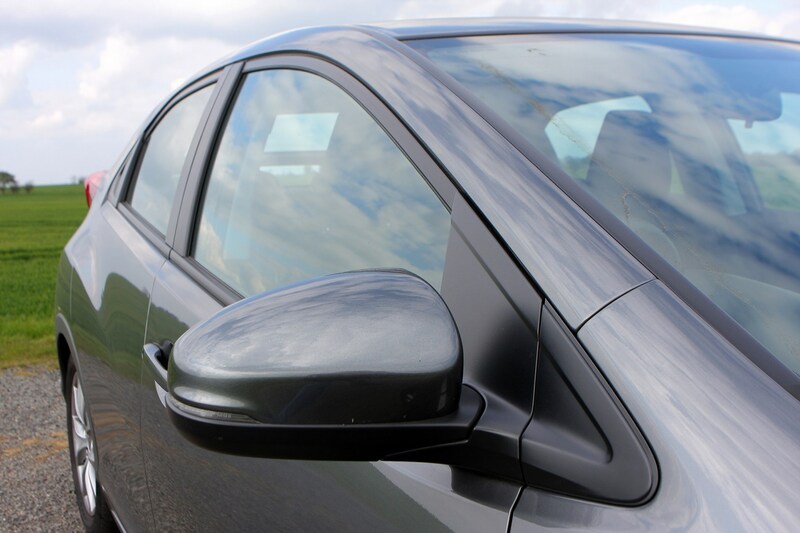 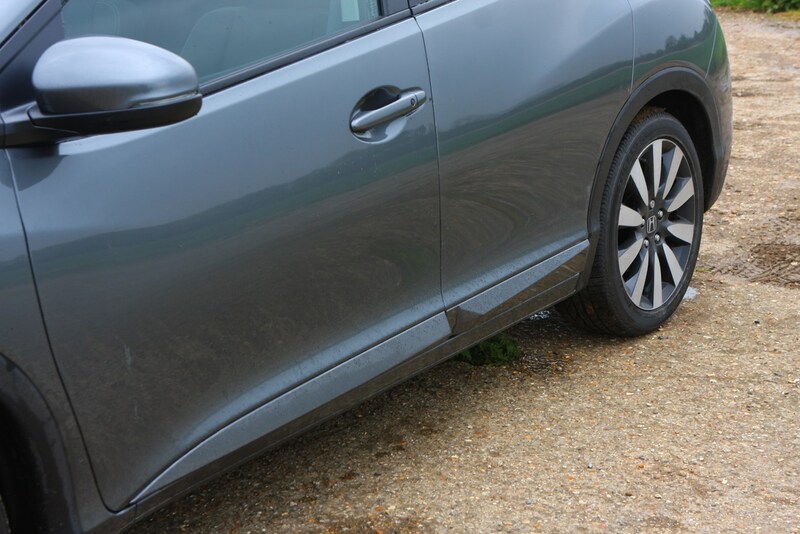 If you corner hard into tight turns the Civic's nose tends to straight-line in a more pronounced way than other front-wheel-drive cars, but it still grips fairly well in flowing corners. 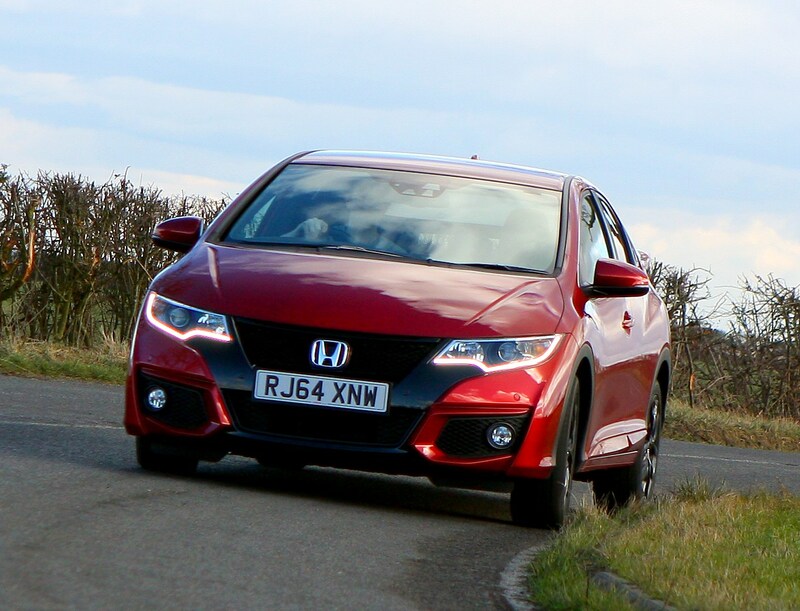 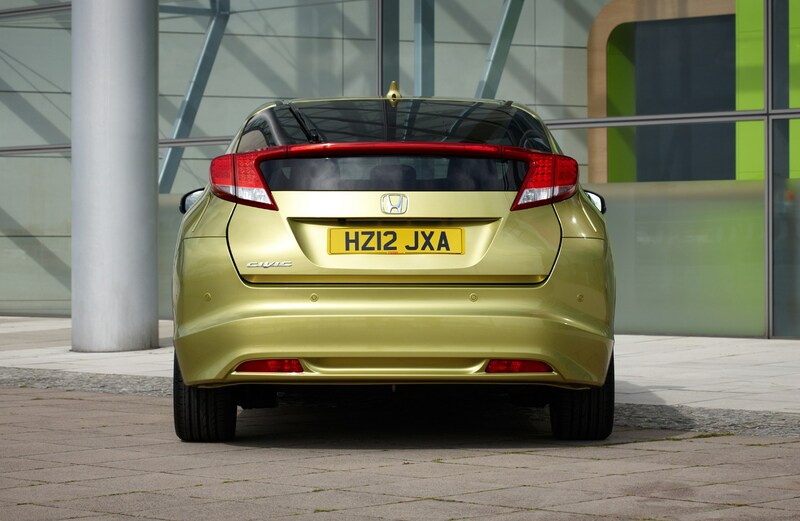 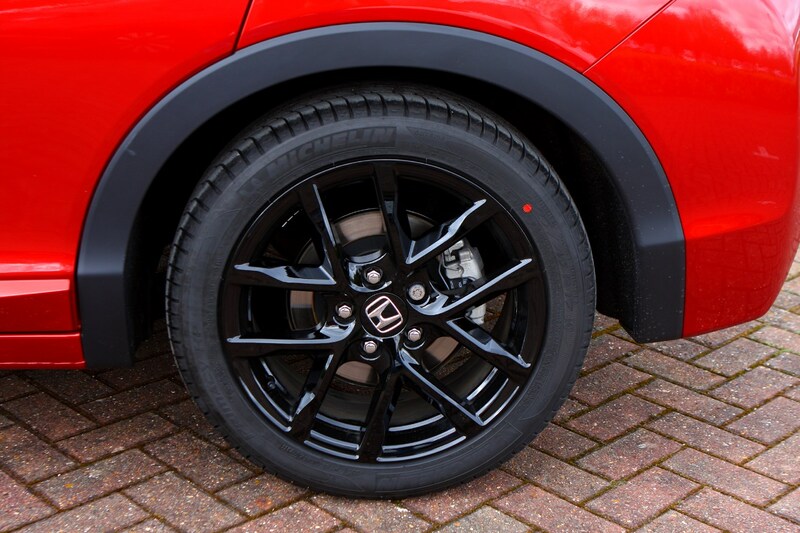 Honda has done a lot of work to improve road-holding, but it's still not quite as good as the Volkswagen Golf or indeed the Ford Focus. 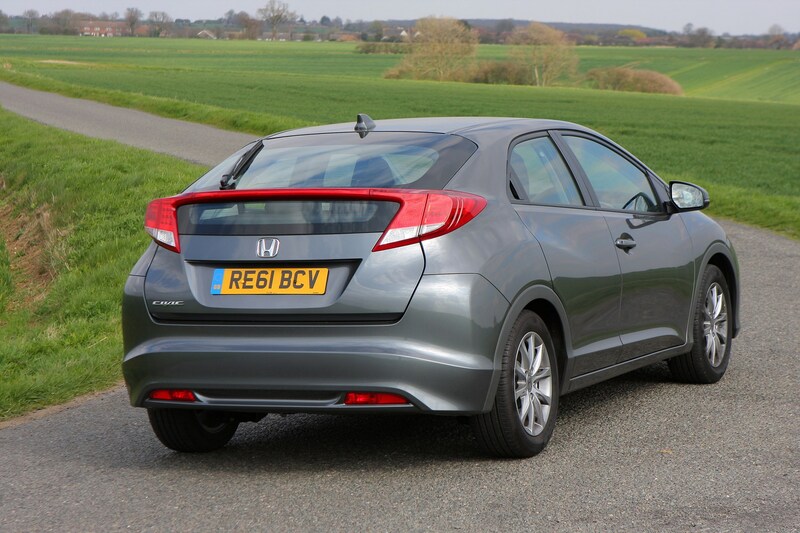 It's on a par with the Vauxhall Astra though. 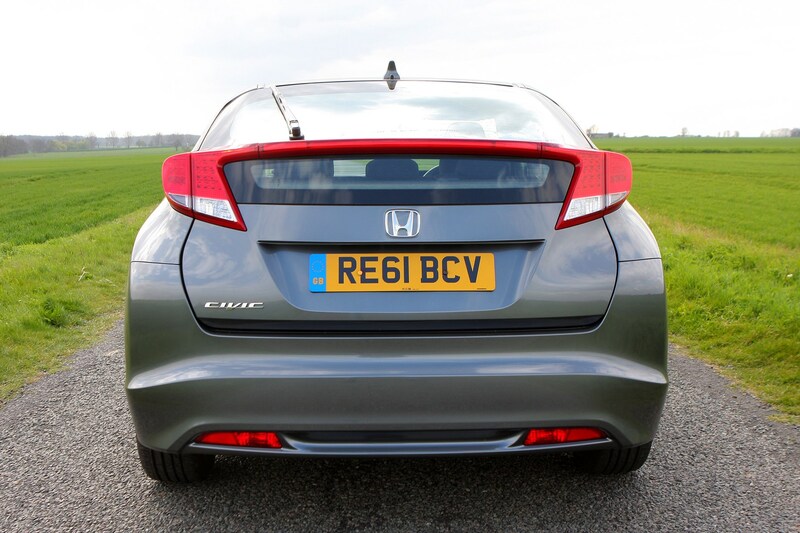 Thicker suspension components have reined in body lean, but only slightly. 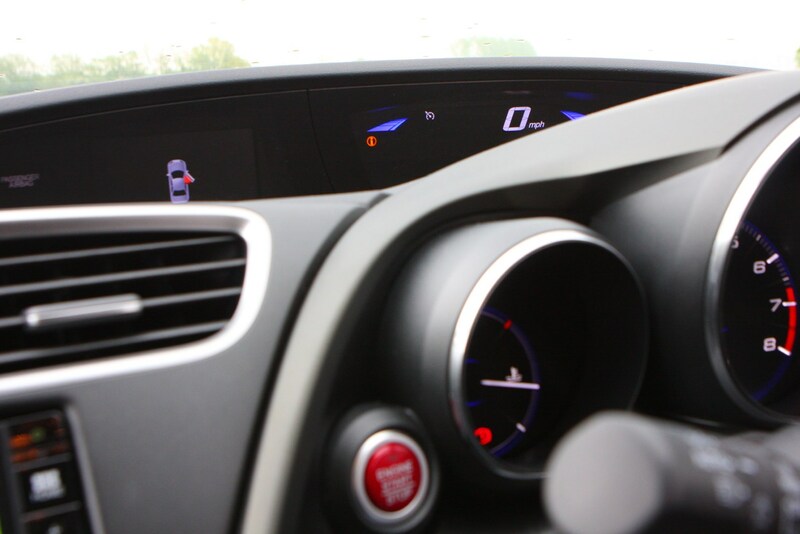 The steering is quick and responsive although there's not much feel. 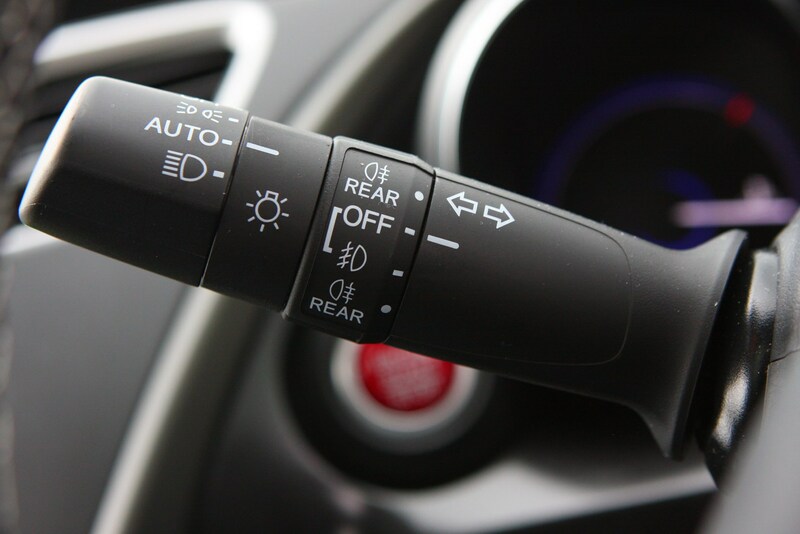 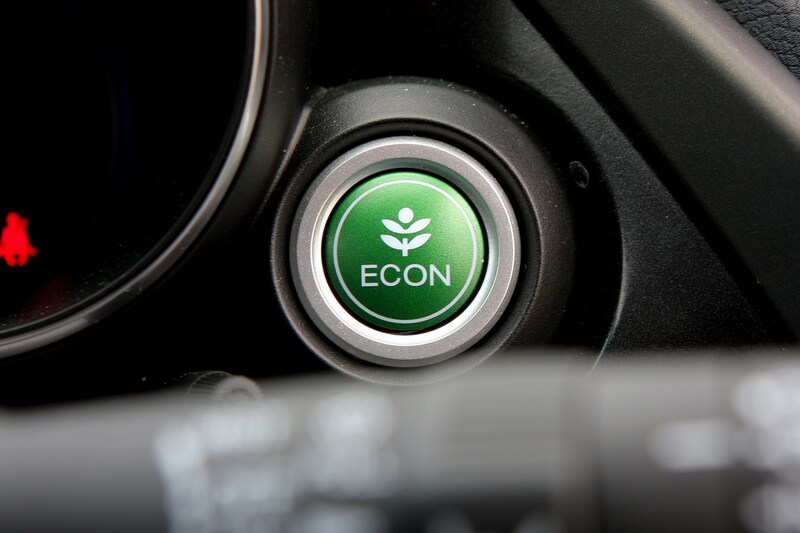 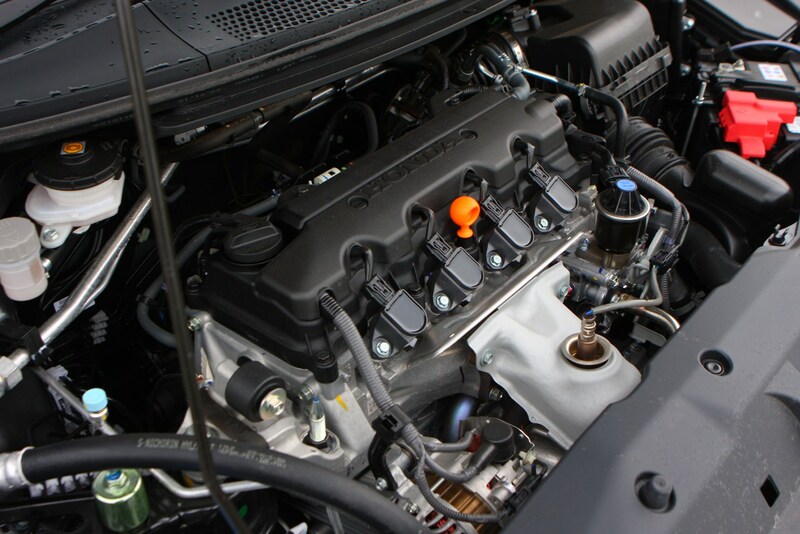 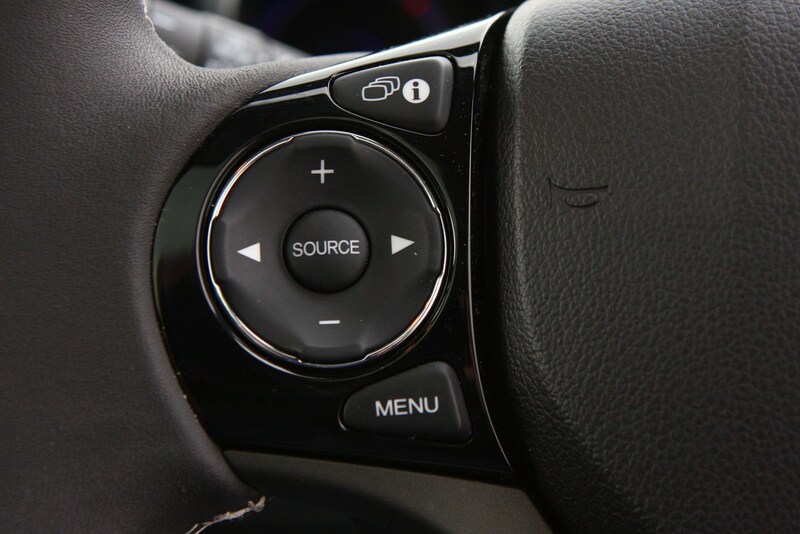 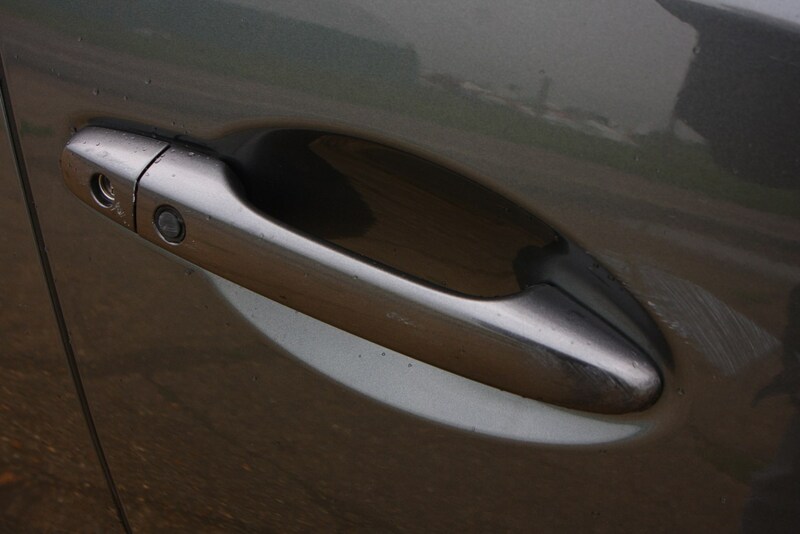 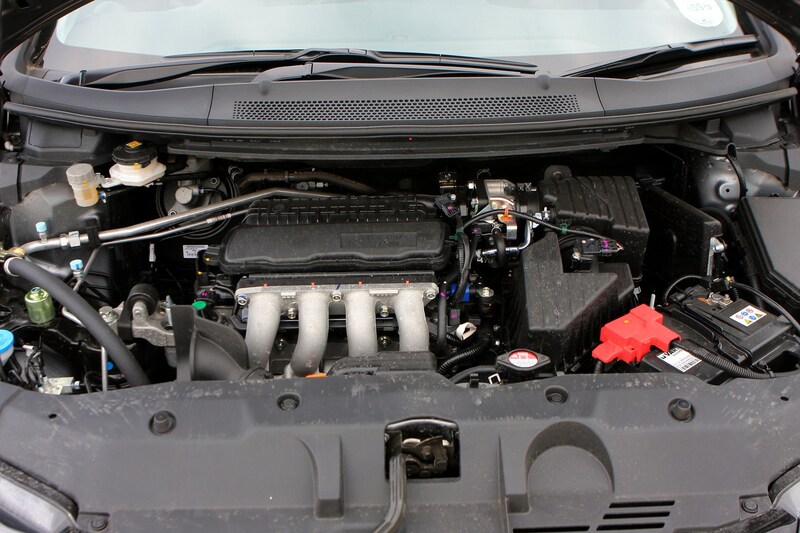 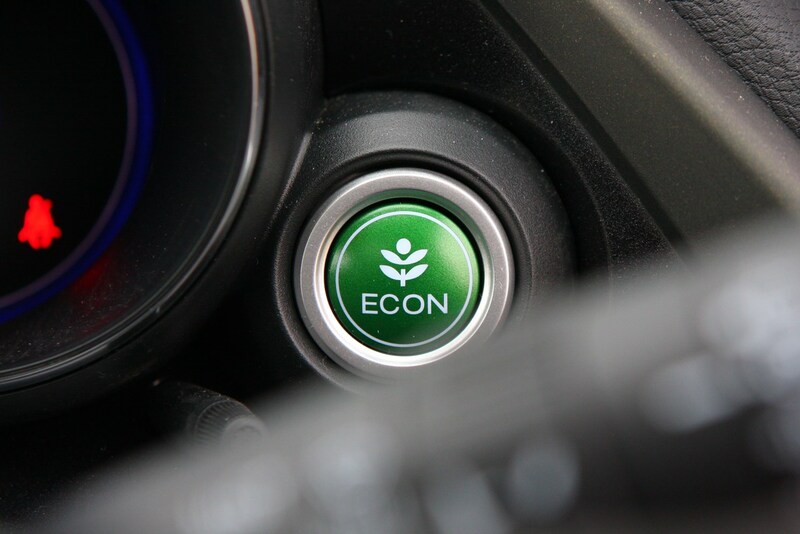 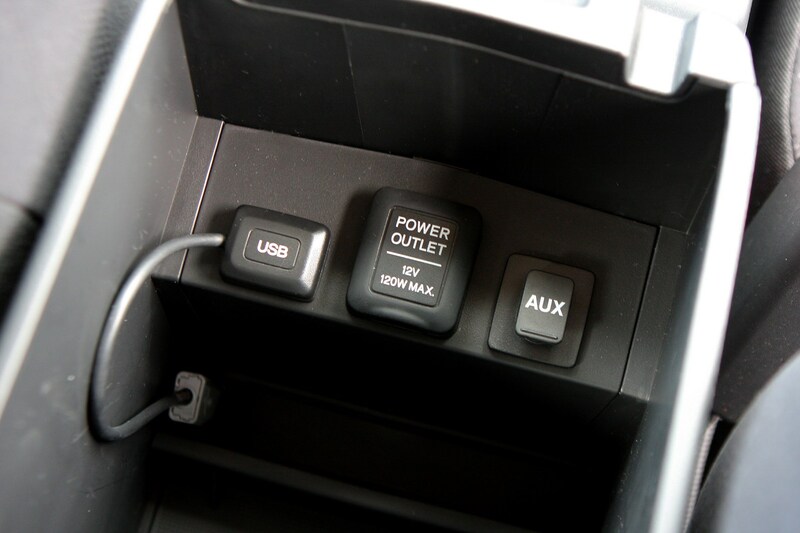 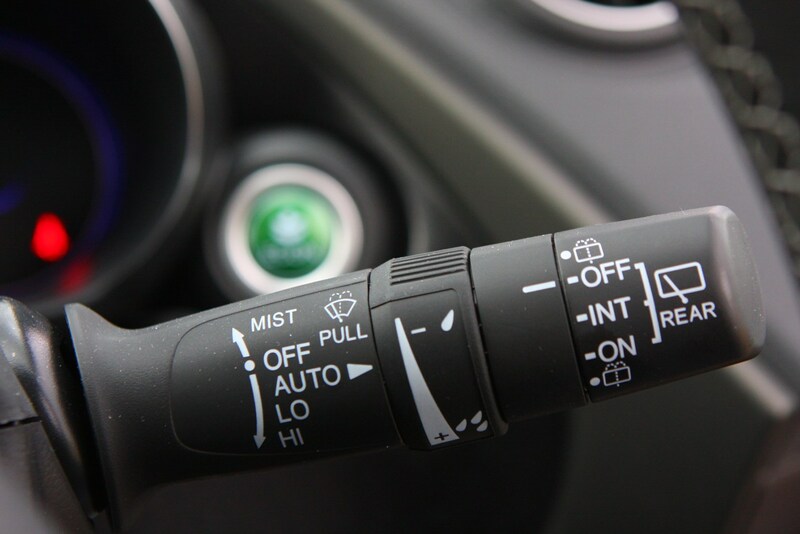 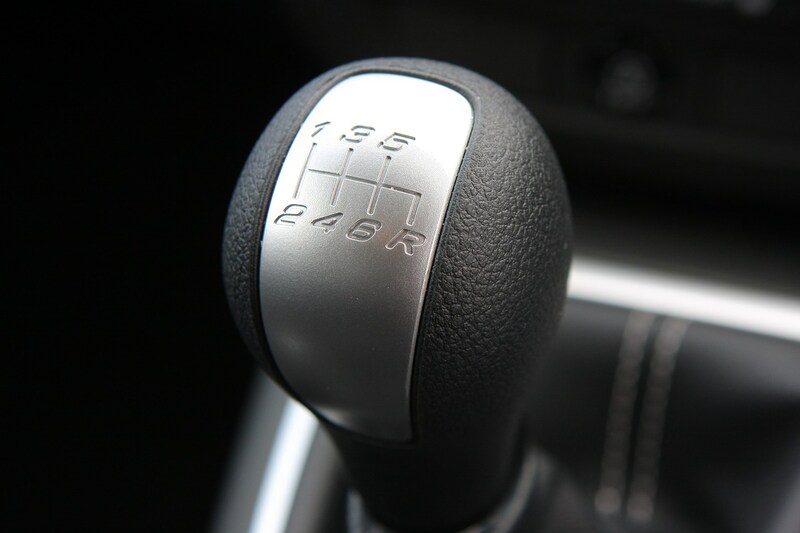 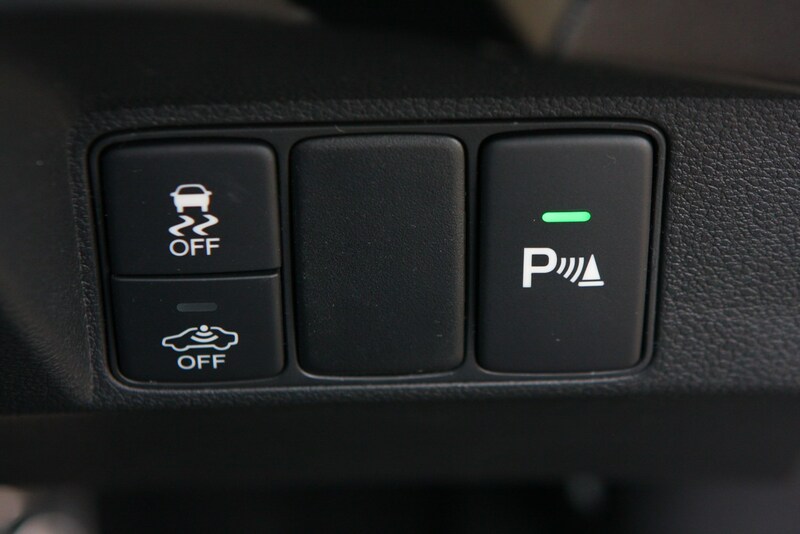 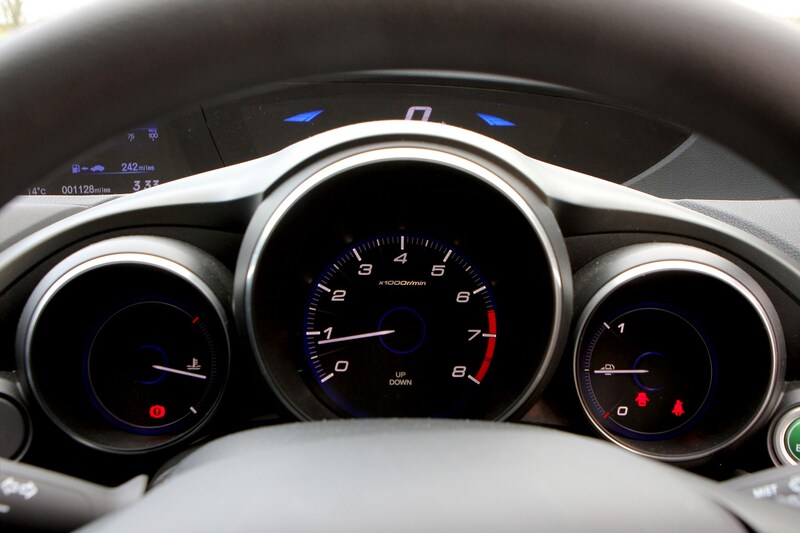 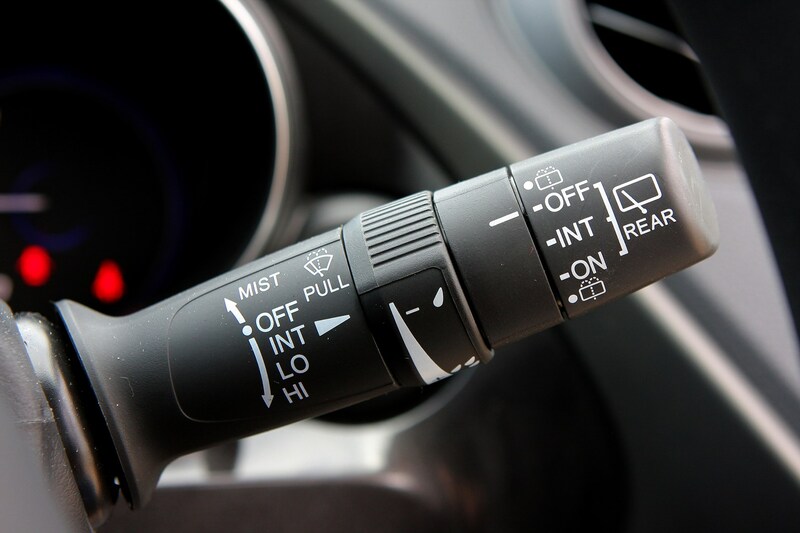 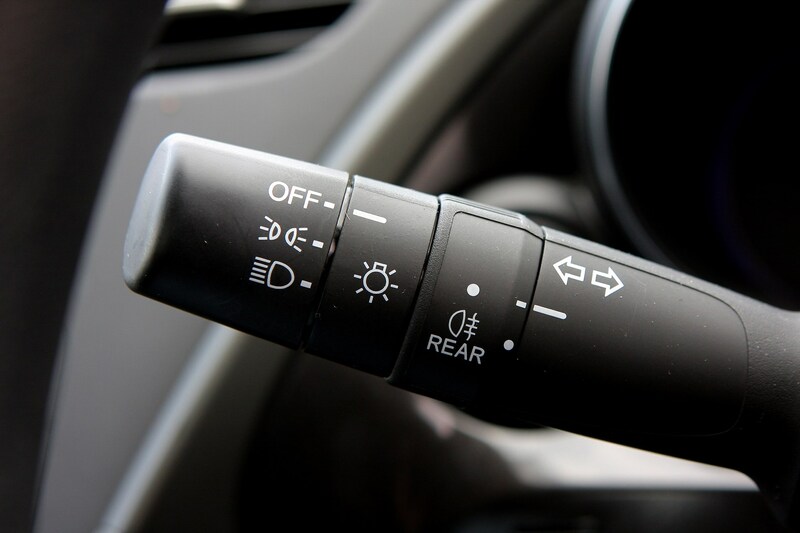 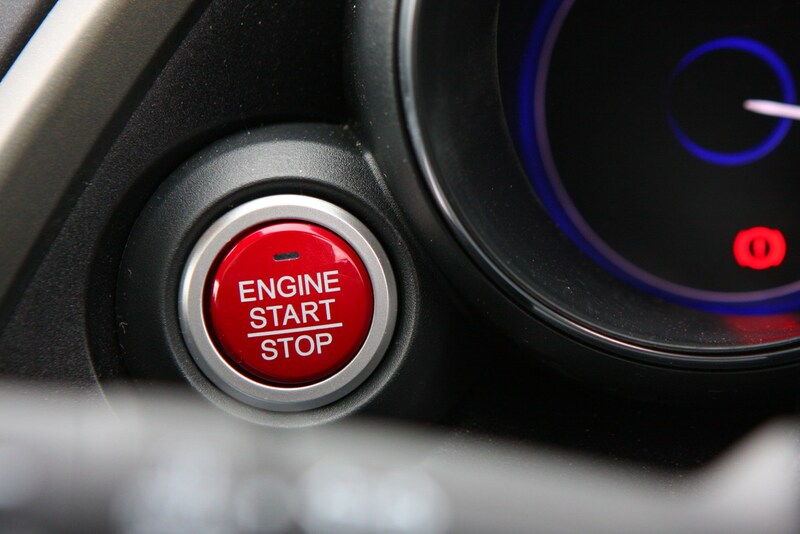 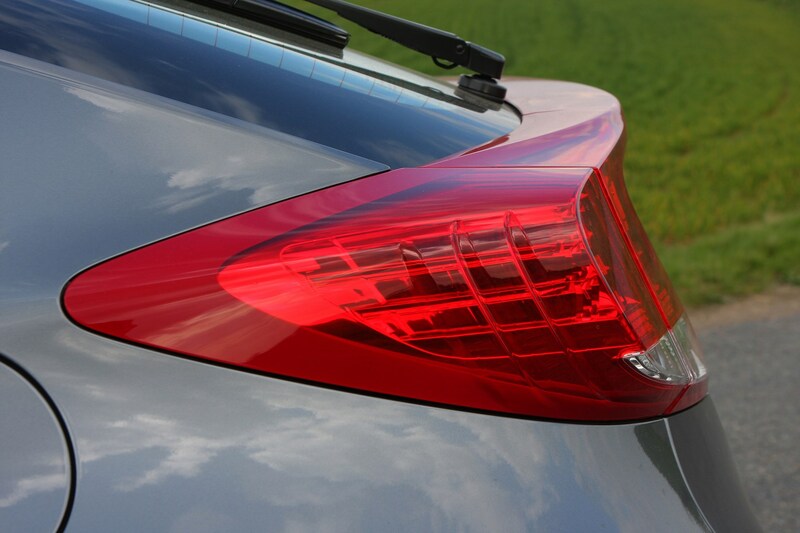 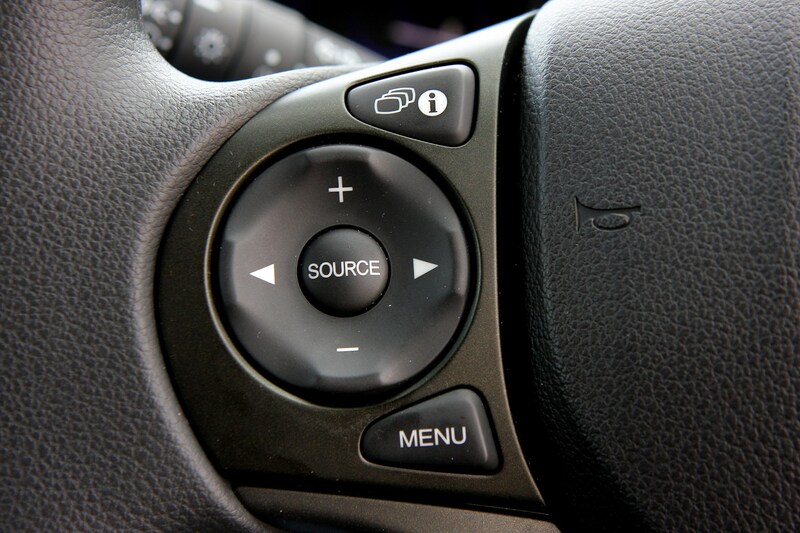 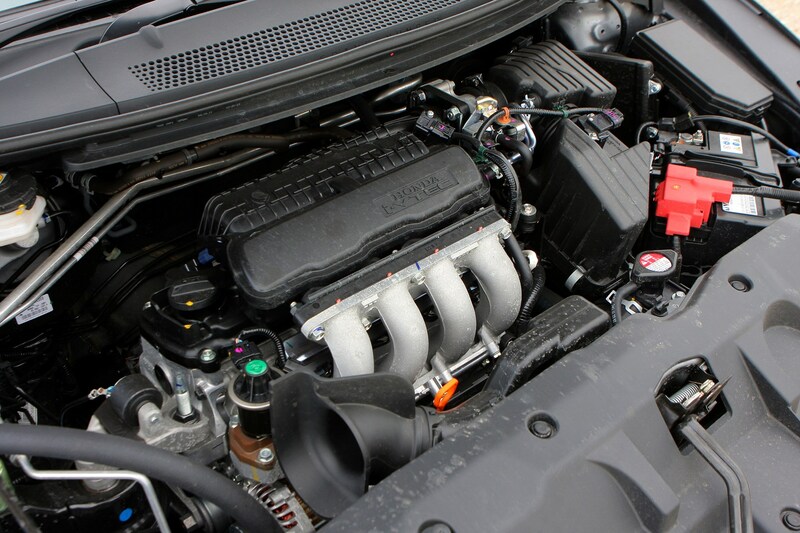 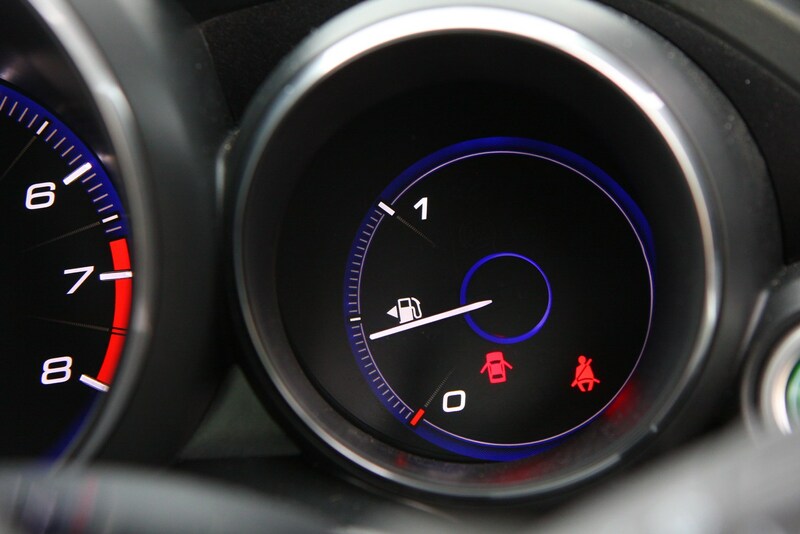 Braking power is reassuring and progressive, however, and the gear change is smooth. 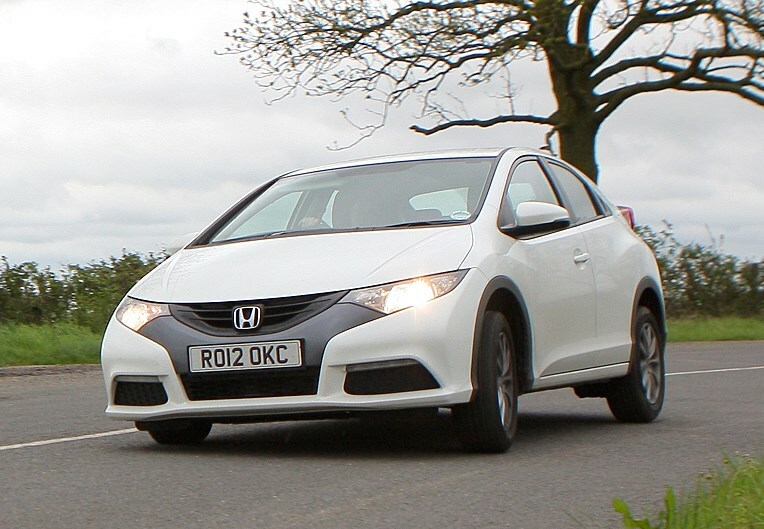 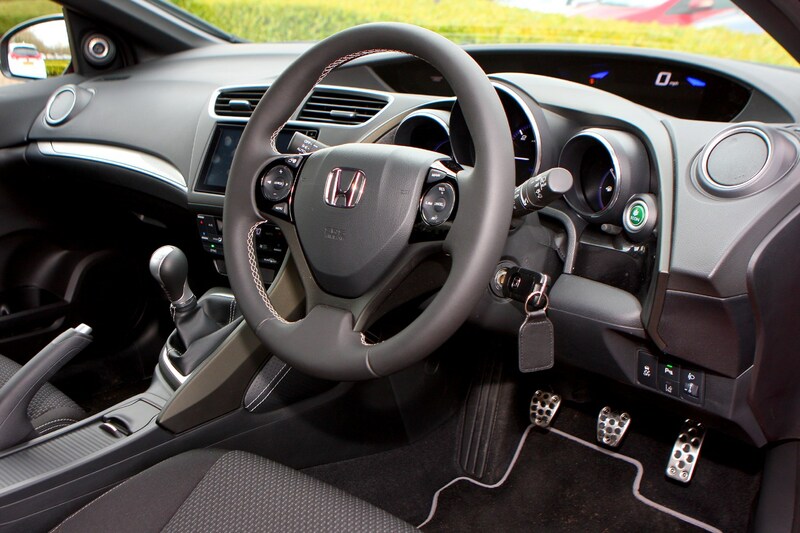 In a bid to improve Honda Civic hatchback handling the facelifted car comes with a revised steering and suspension set-up which promises more engagement behind the wheel and less body-roll in corners. 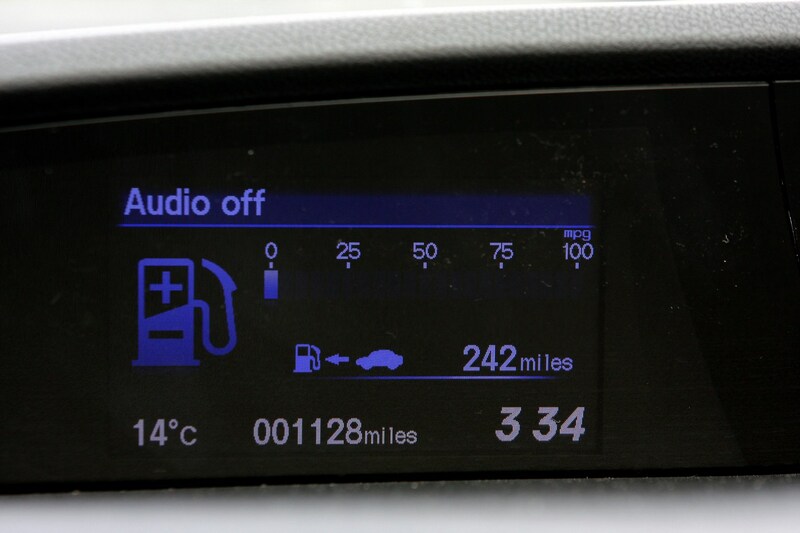 There is logic behind the dashboard layout but it still feels a little confusing. 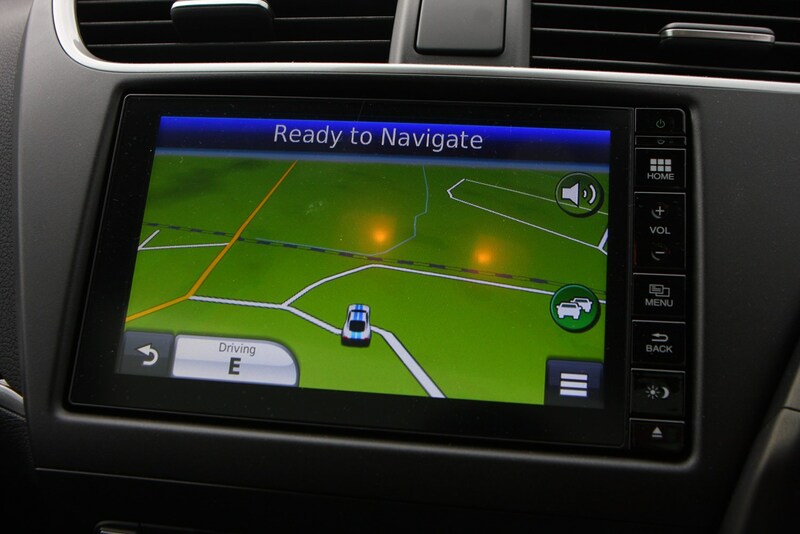 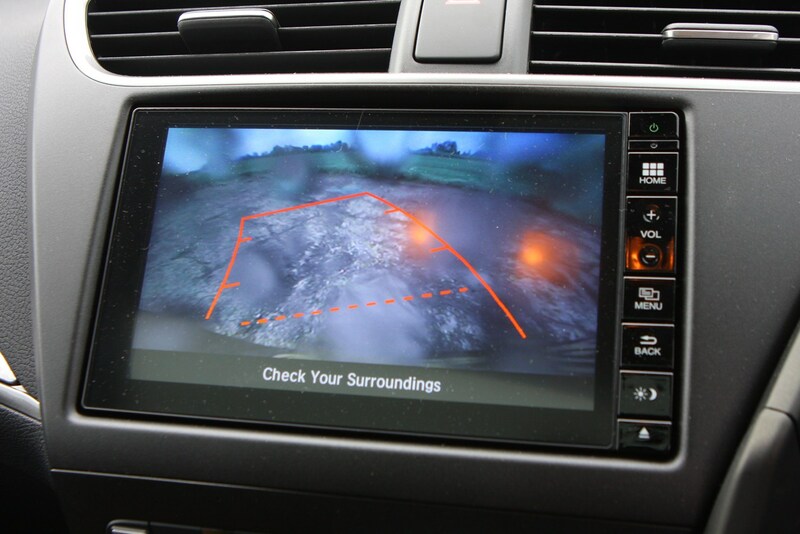 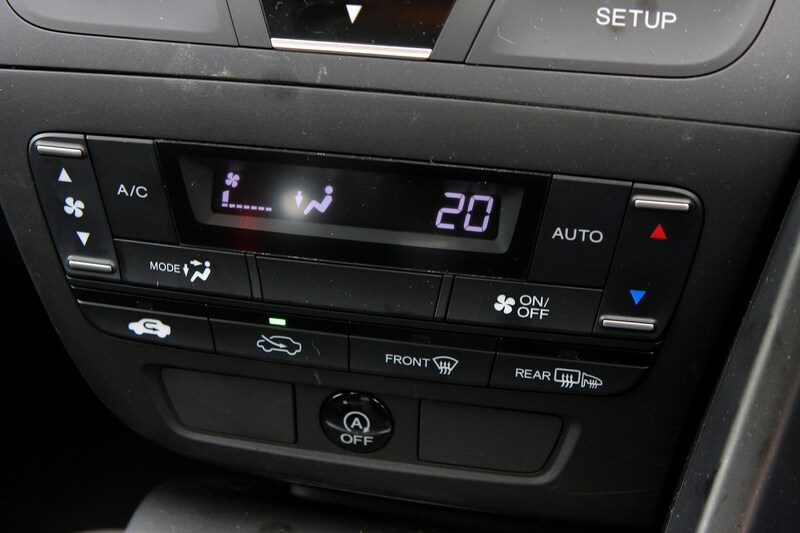 You have the main instrumentation in front of you and the entertainment, climate control and sat nav at the side, which is normal, but it's still a bit haphazard. 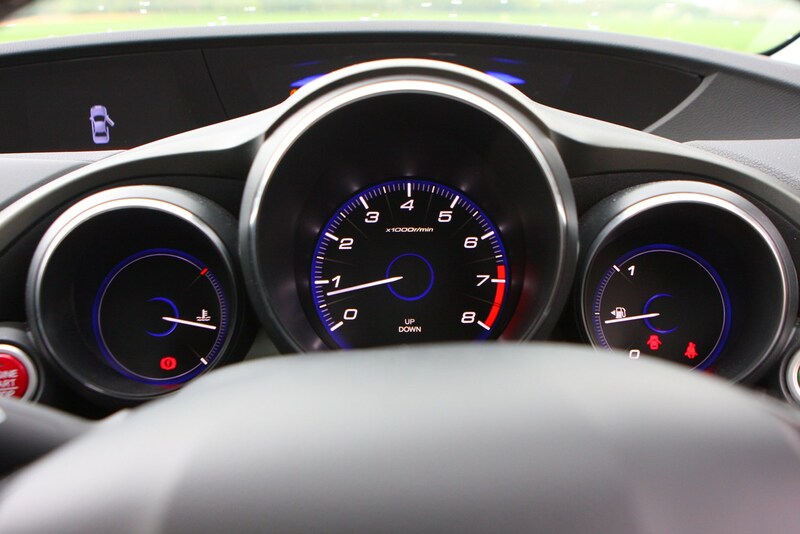 Your speed is displayed in digital reading in front of you and the rev-counter is in the main binnacle, but the eco-indicators and other readouts are a little complicated and illogical. 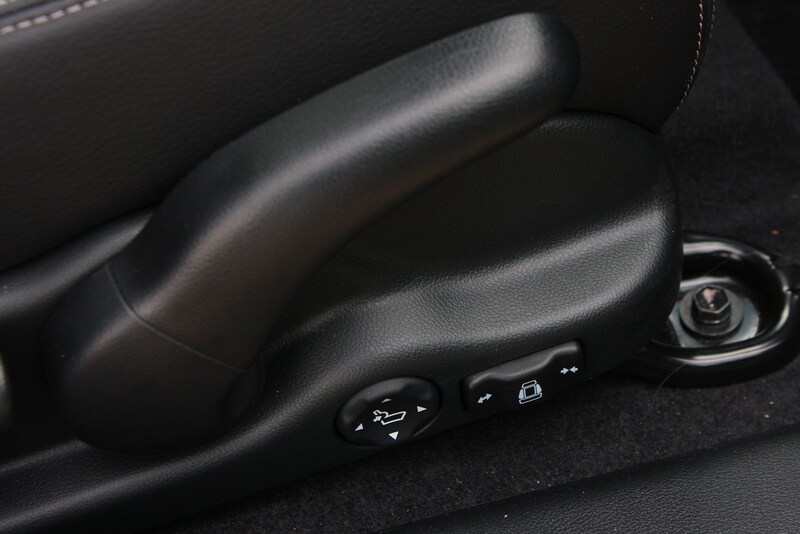 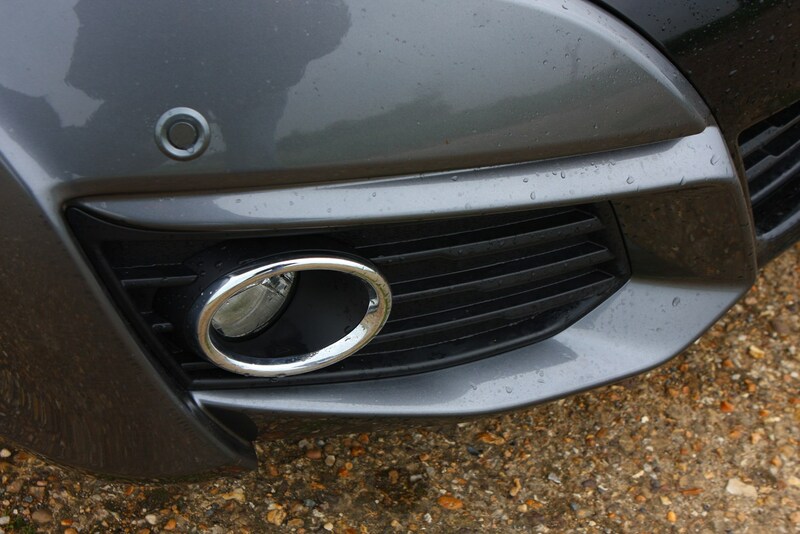 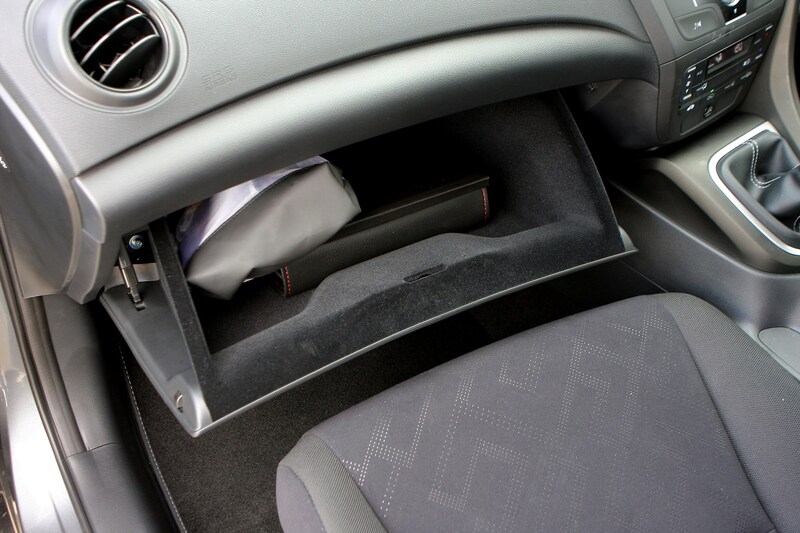 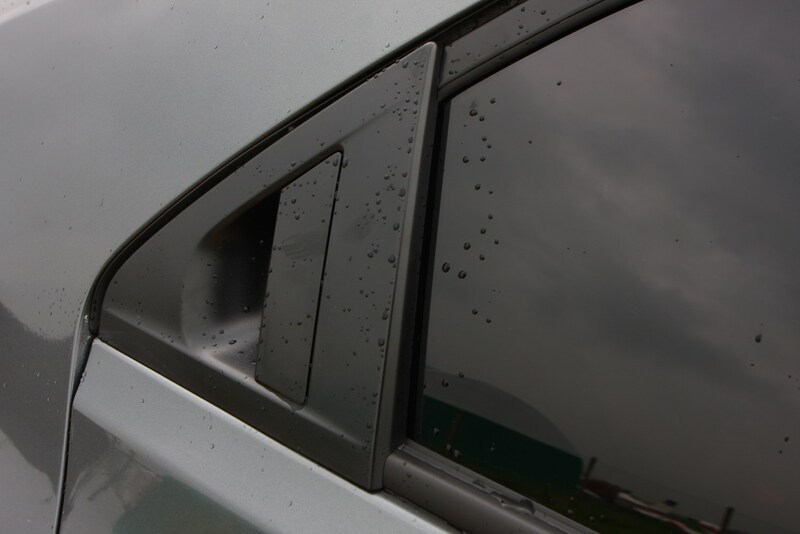 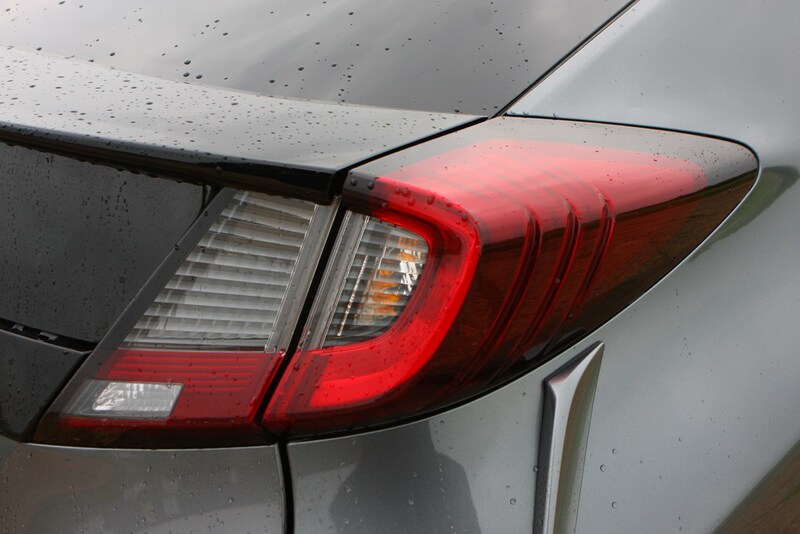 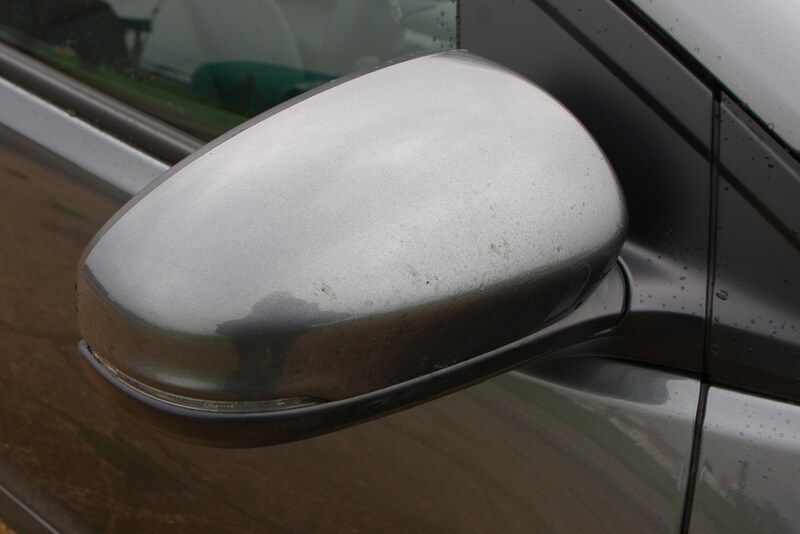 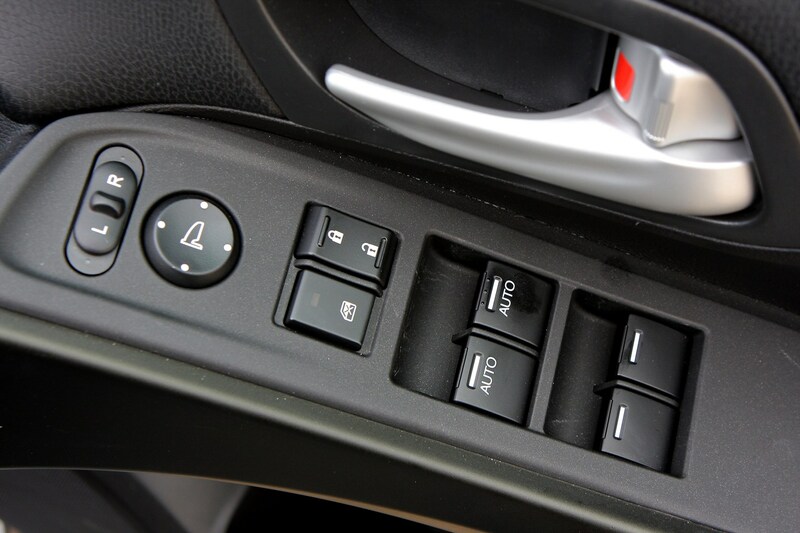 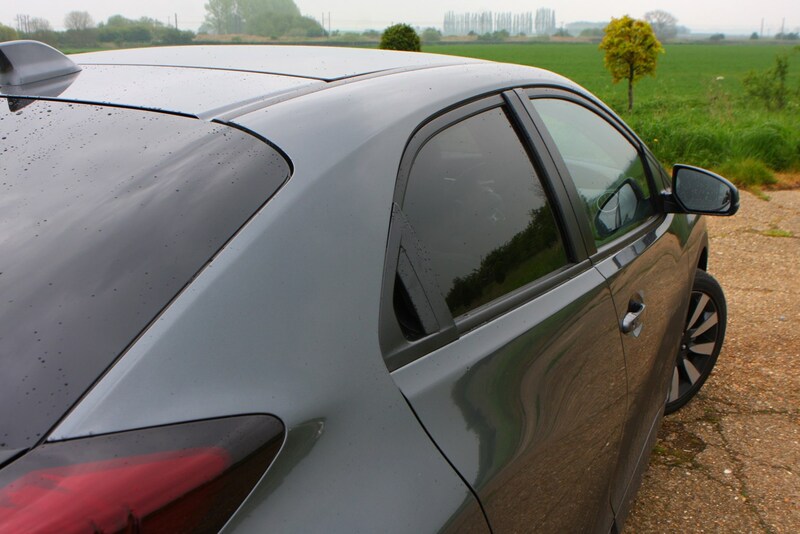 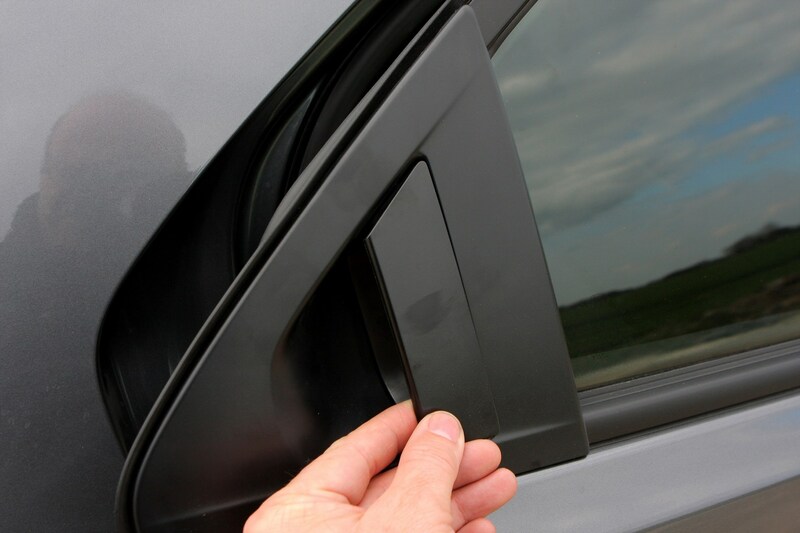 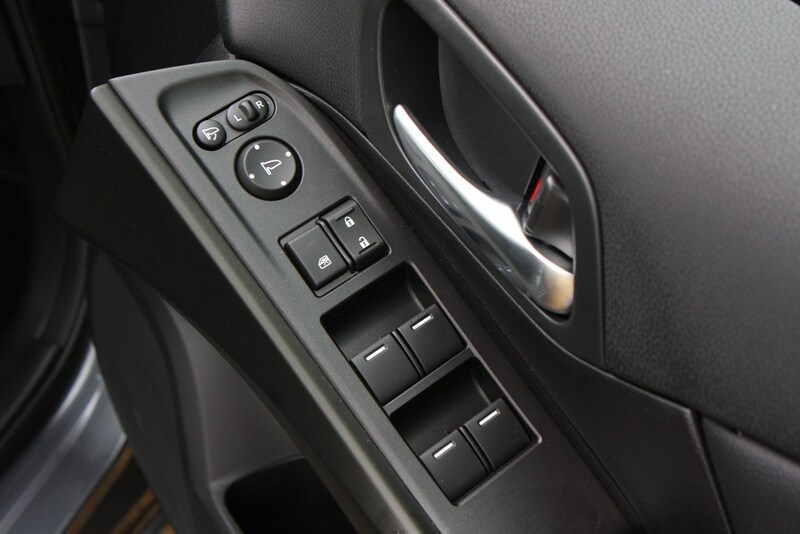 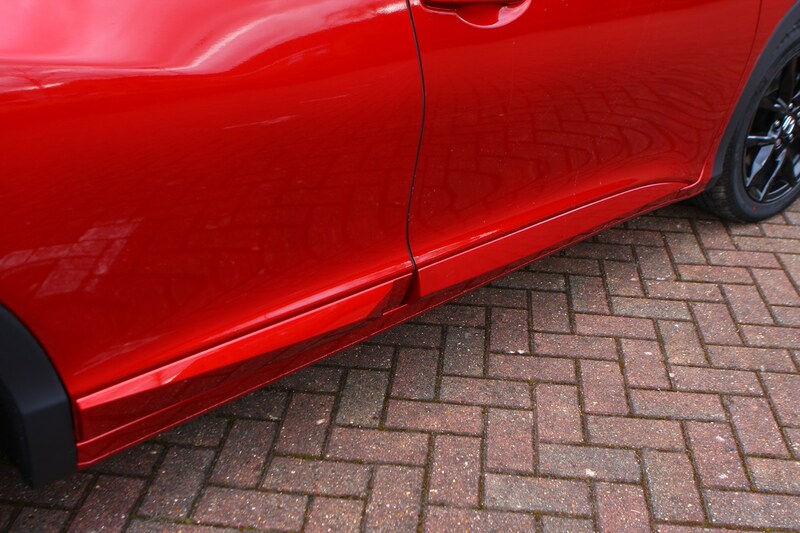 Of course, you'll get used to it, but other manufacturers have tidier, better thought-out designs. 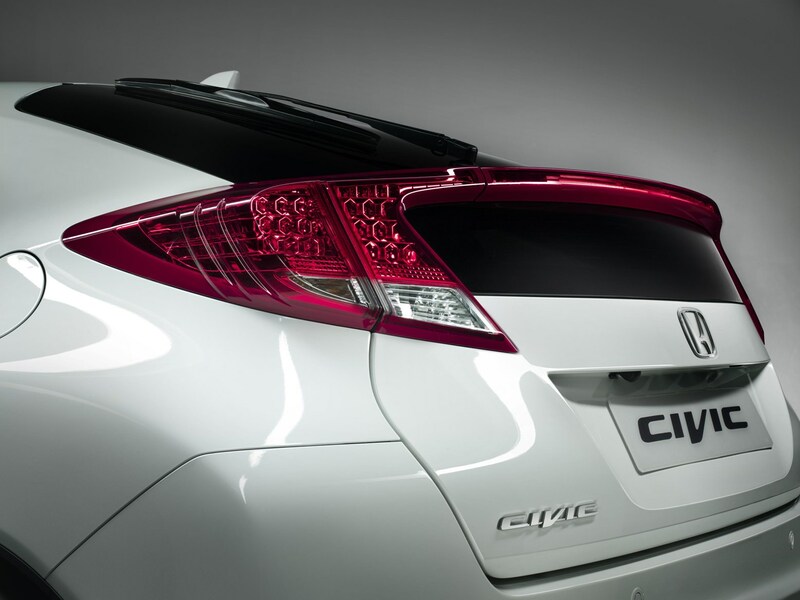 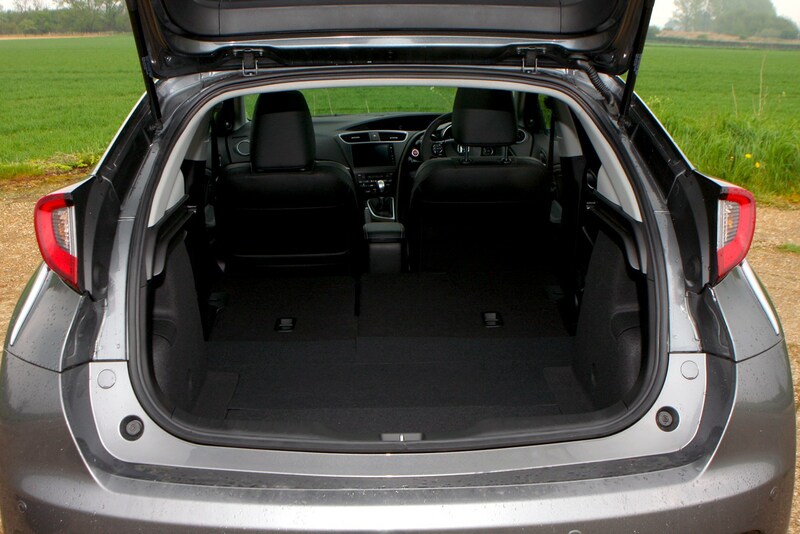 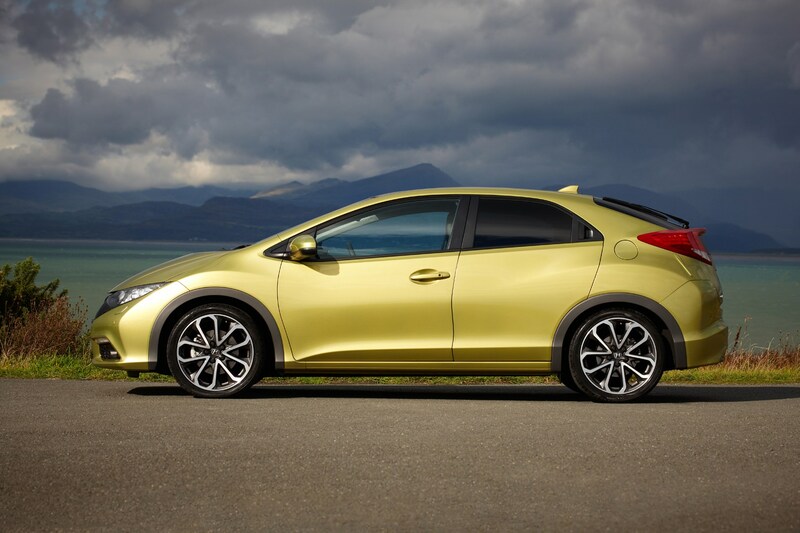 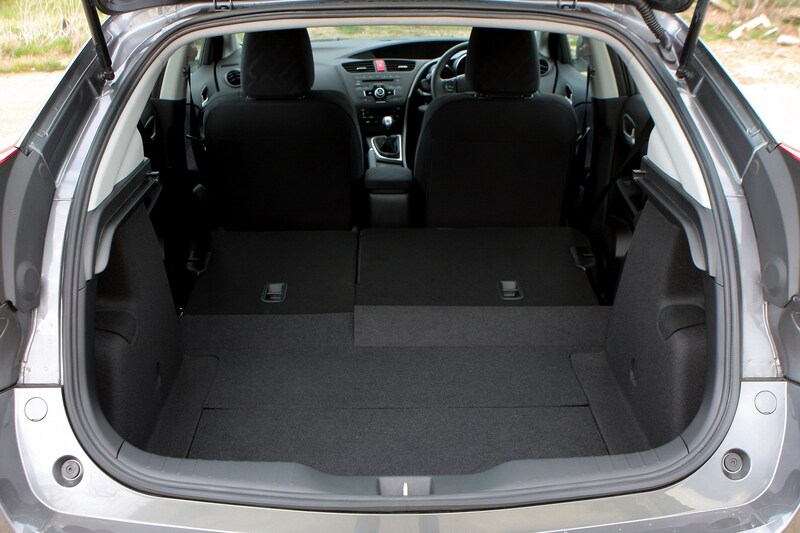 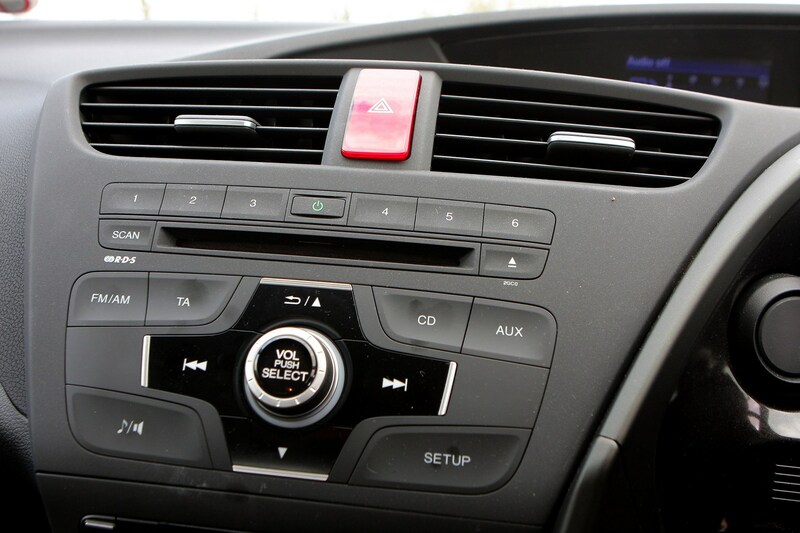 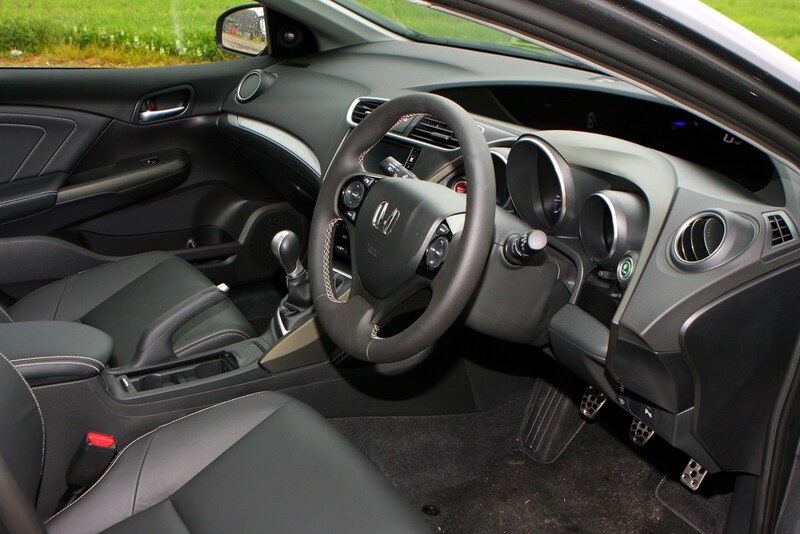 Honda Civic comfort levels are fairly high. 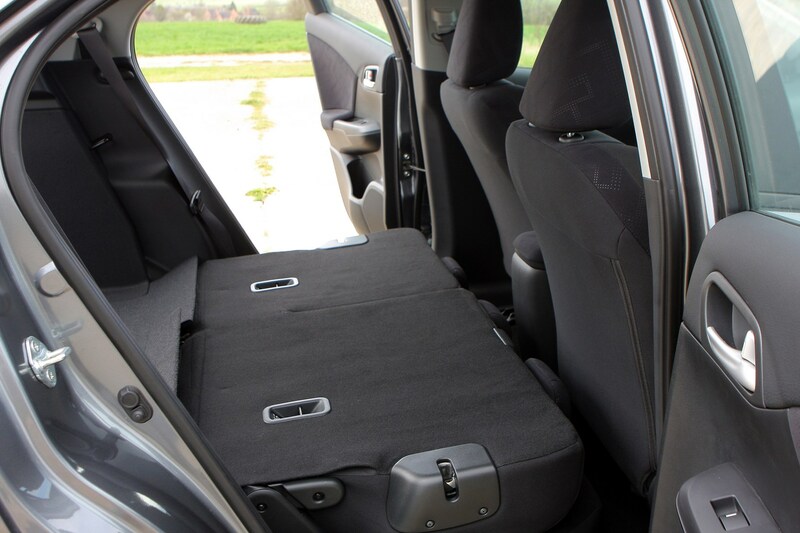 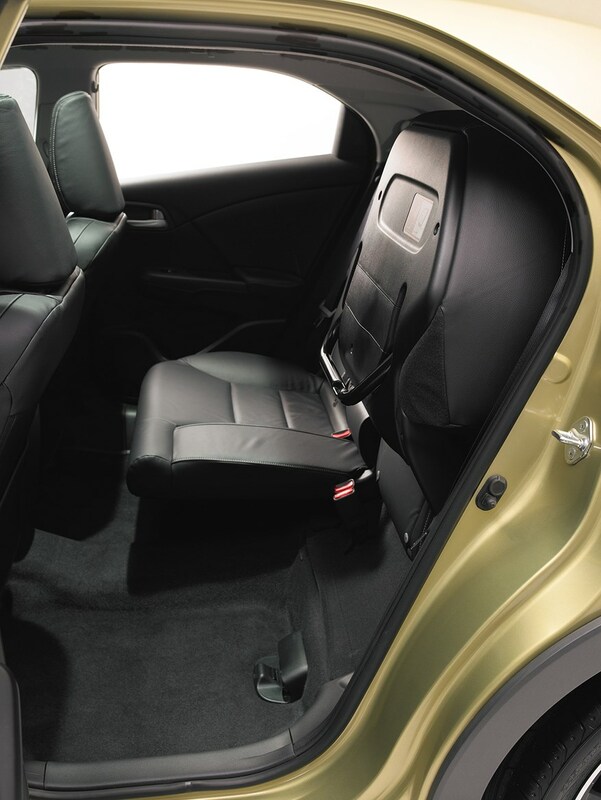 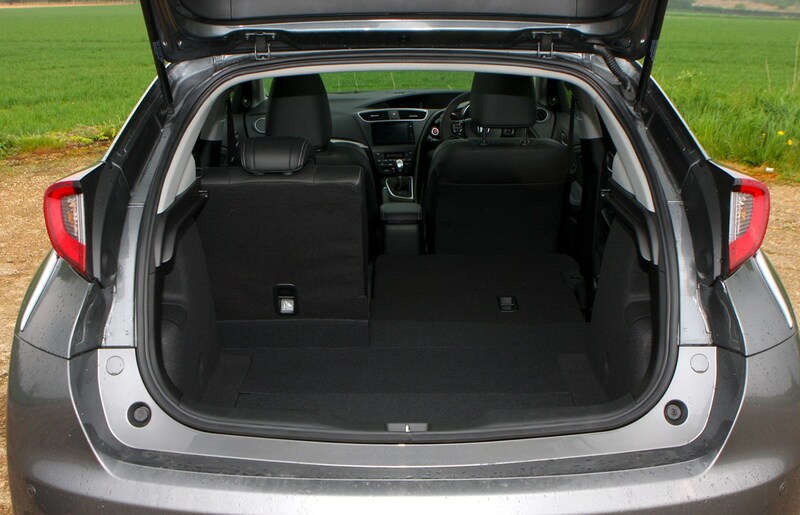 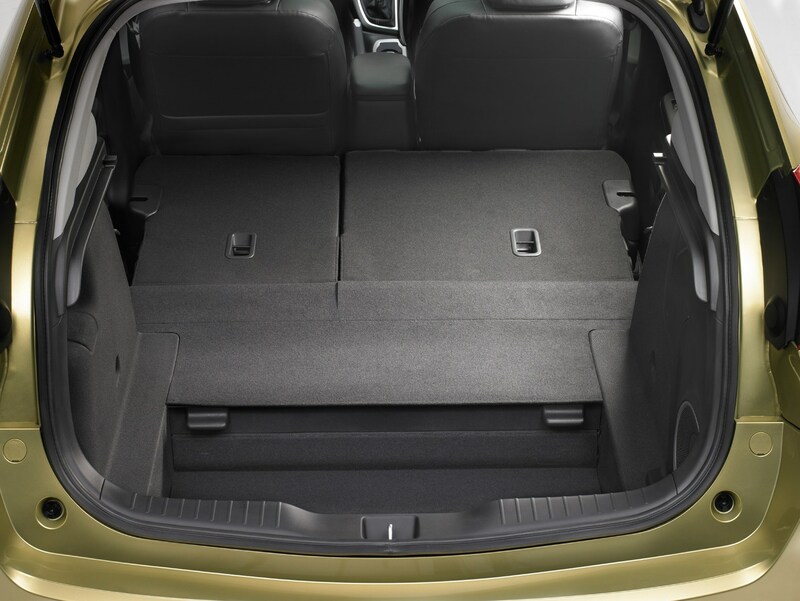 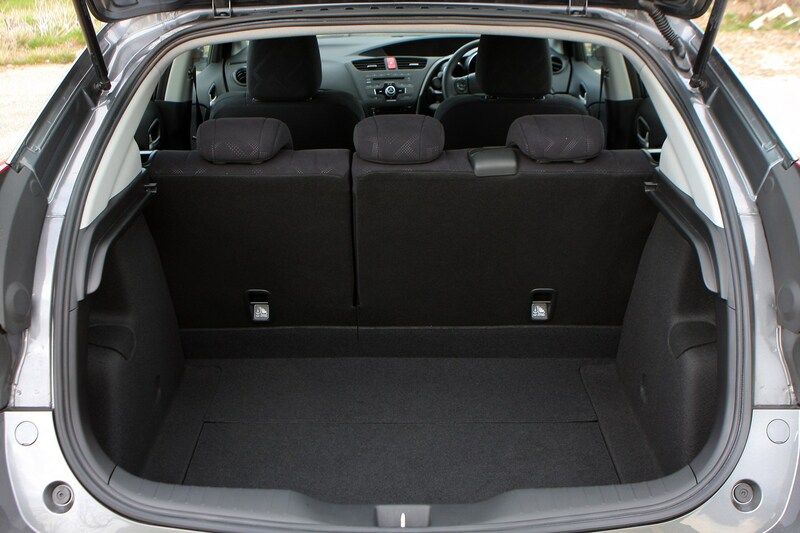 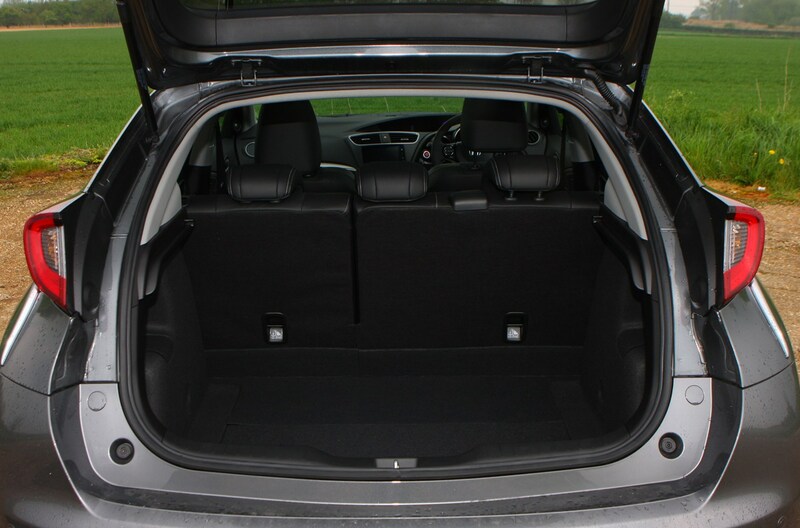 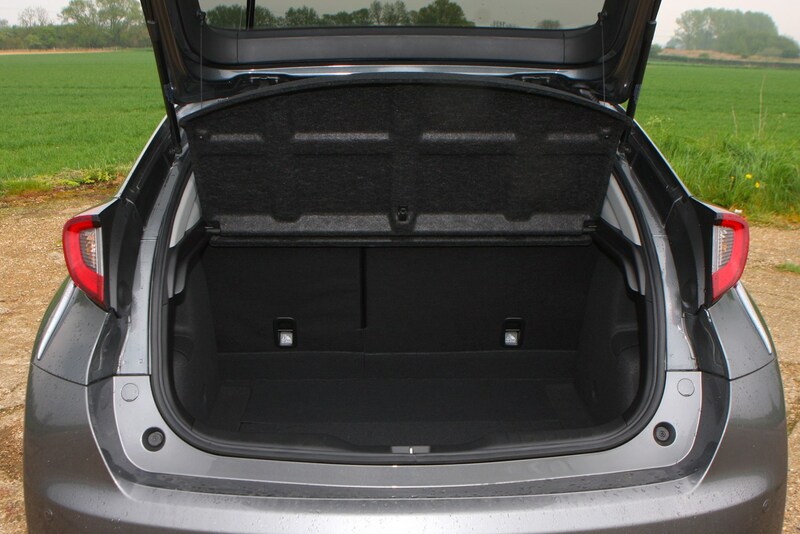 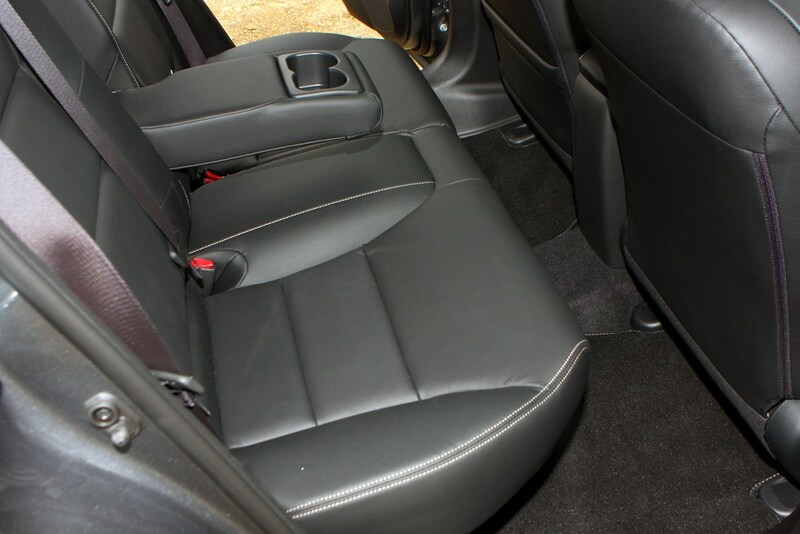 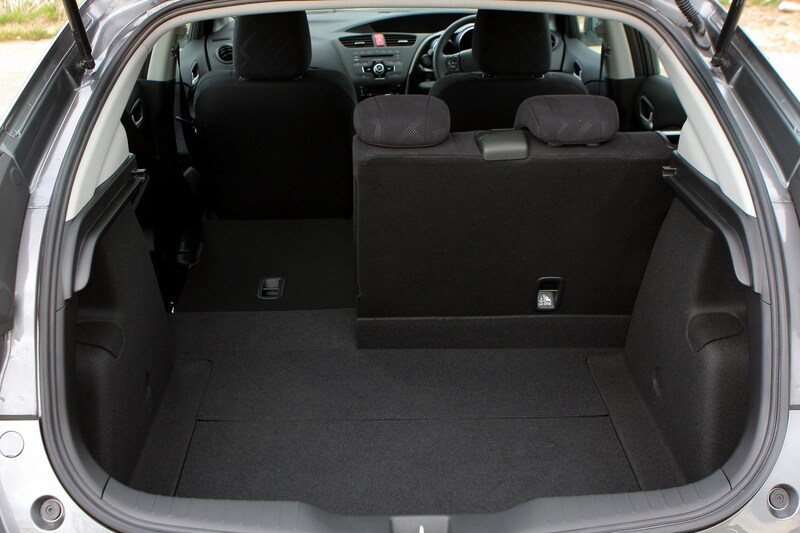 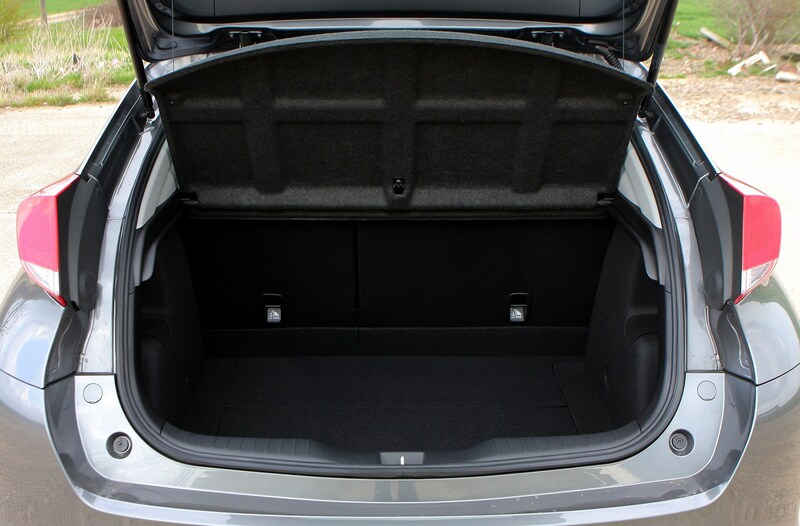 The seats offer plenty of back support, but there could be a little bit more side support to hem you in on faster corners. 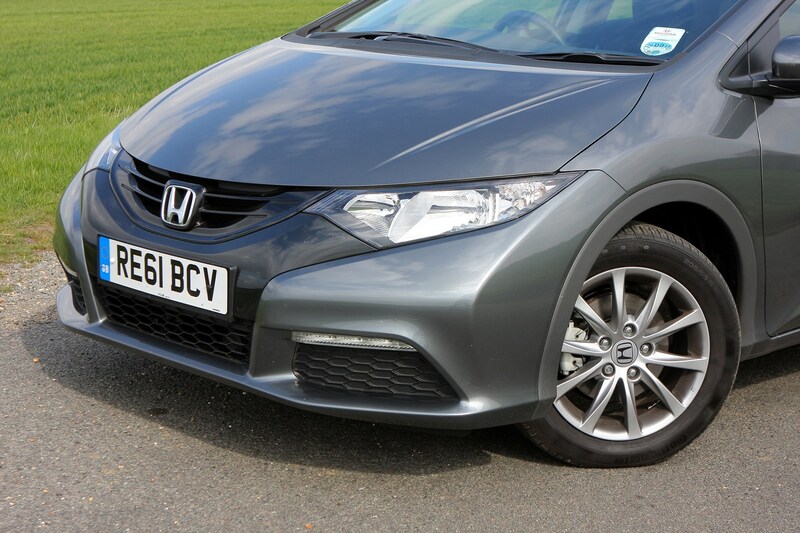 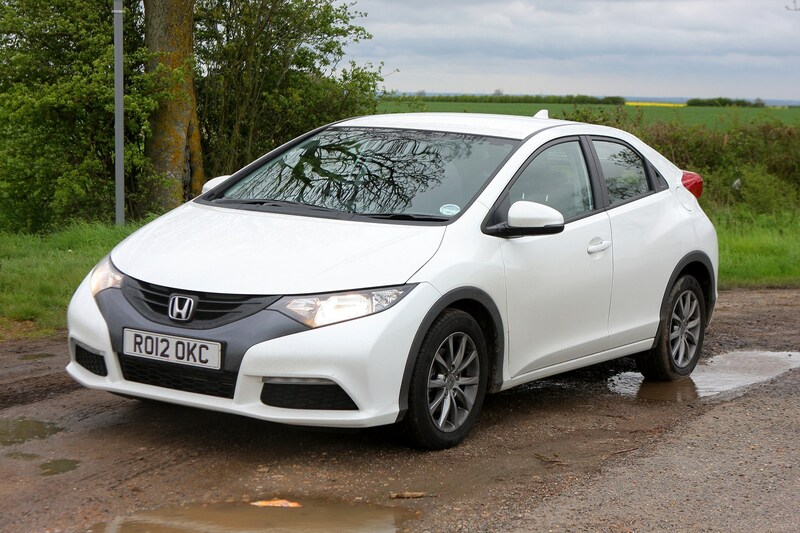 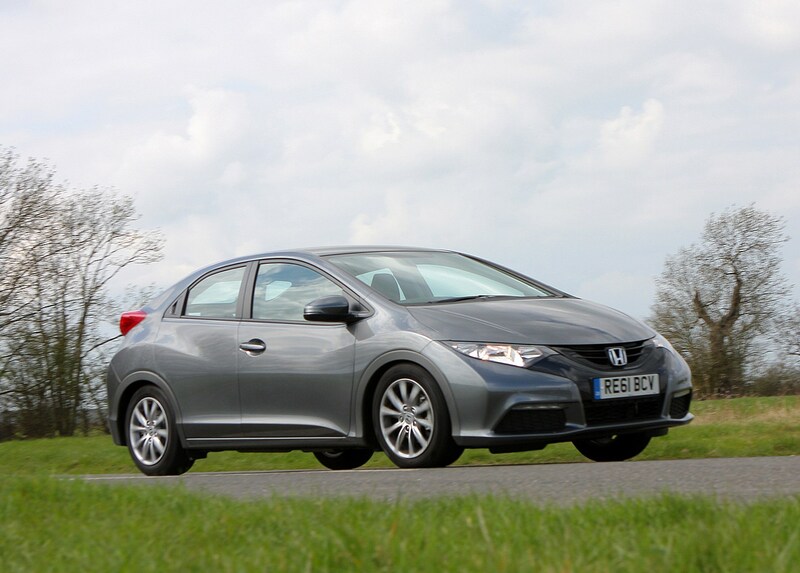 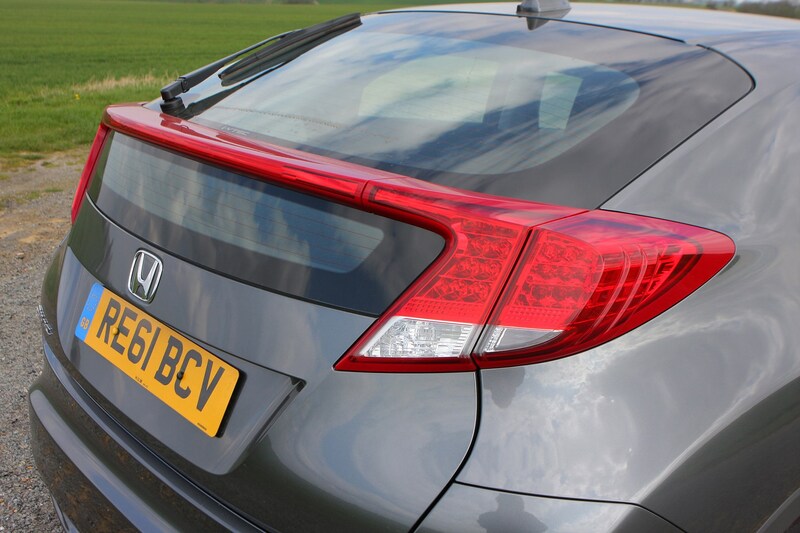 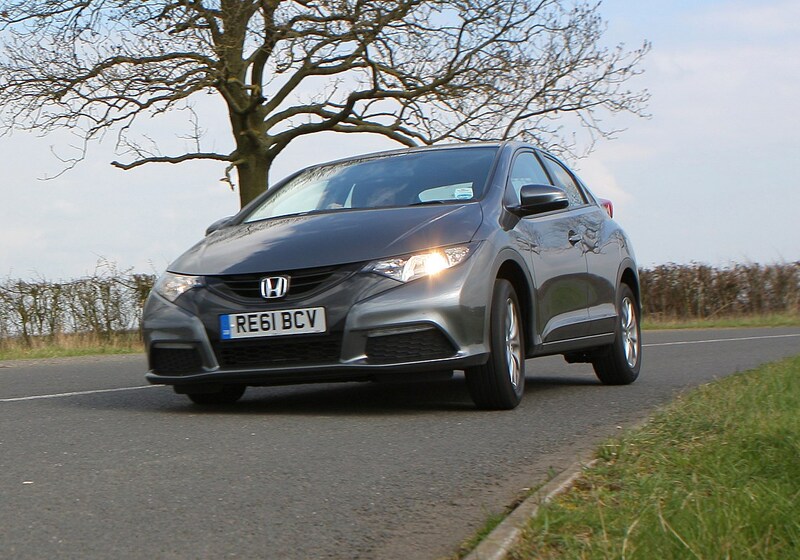 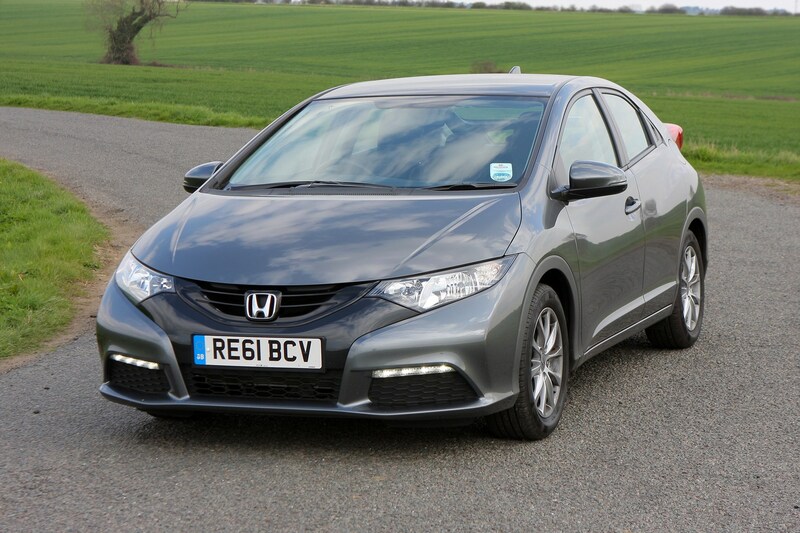 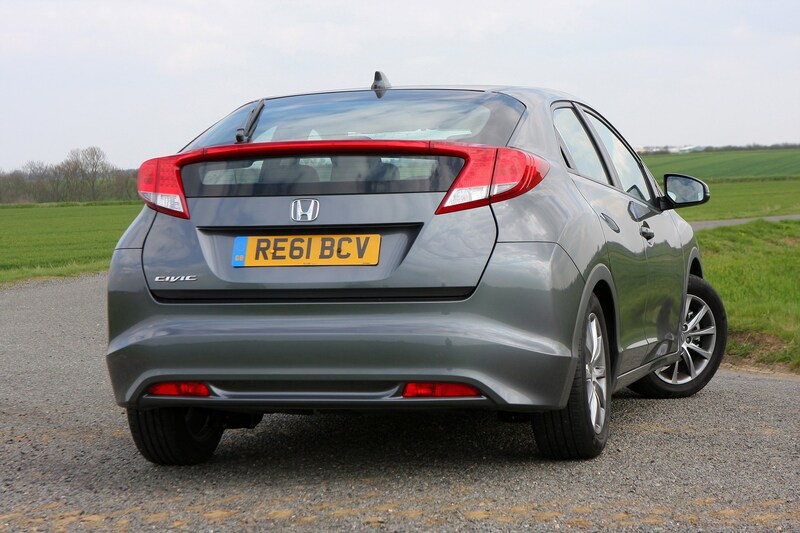 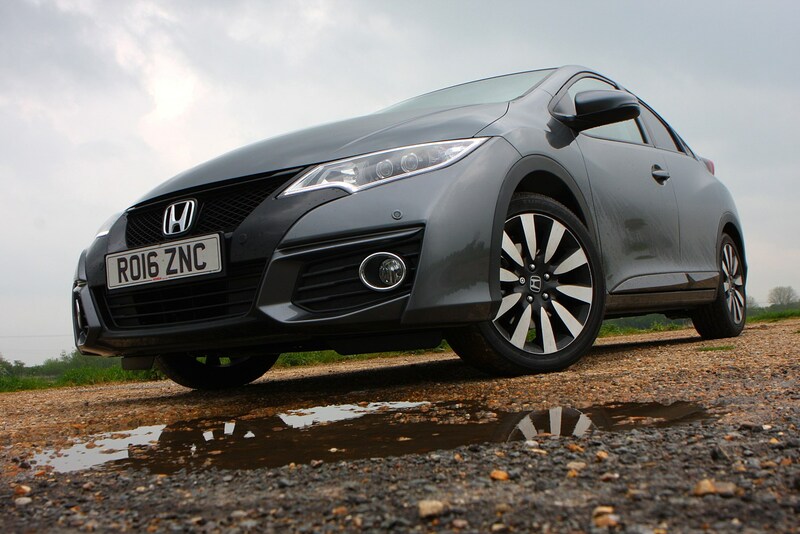 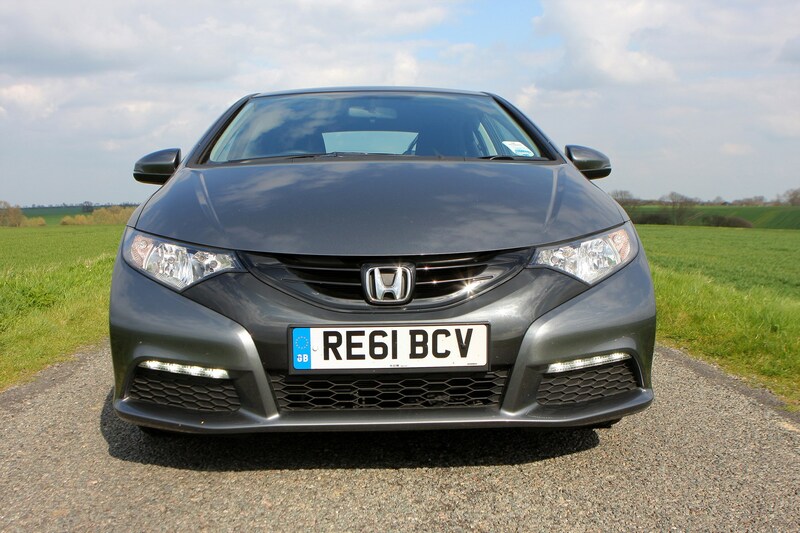 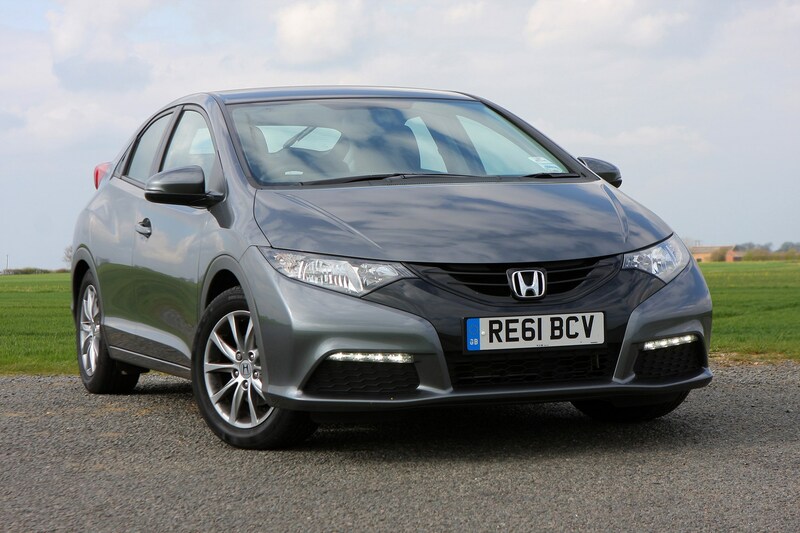 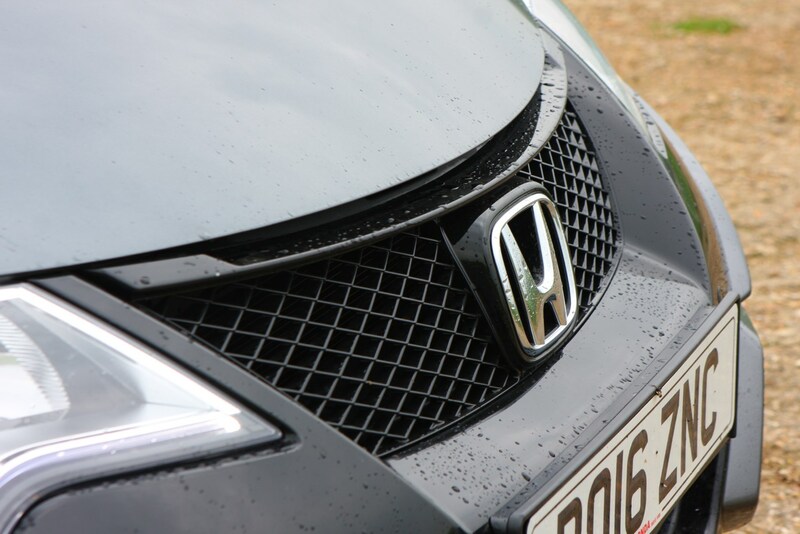 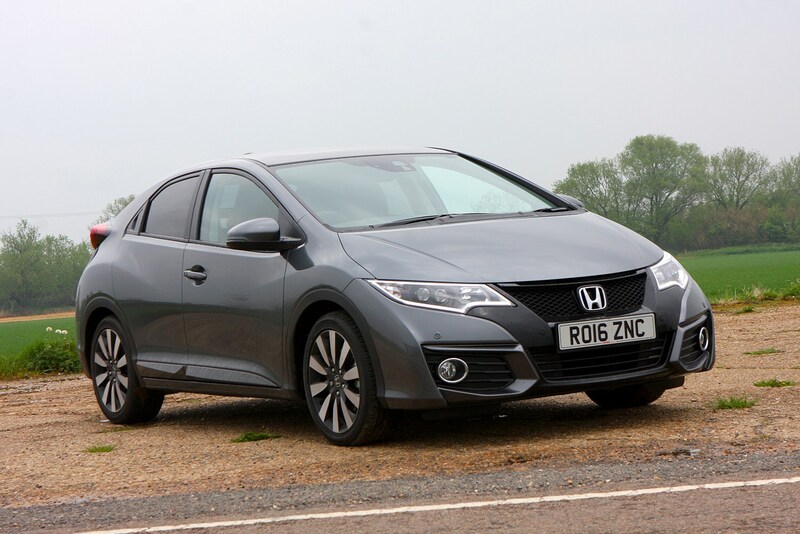 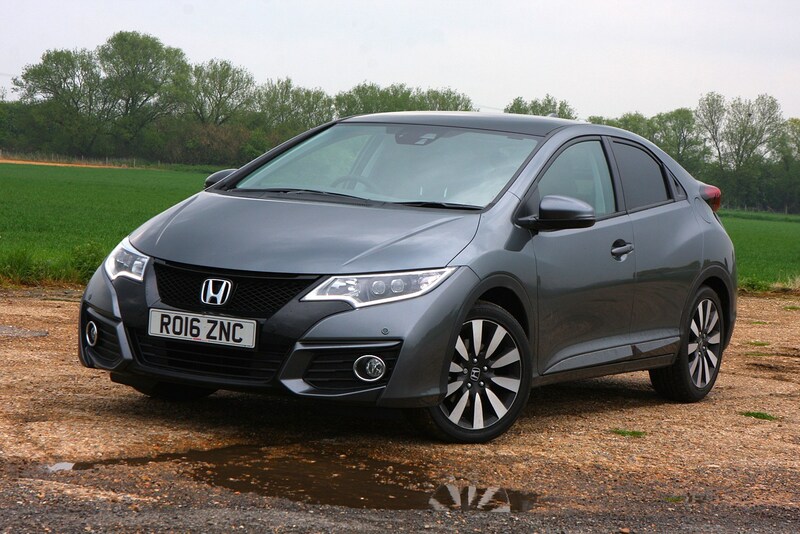 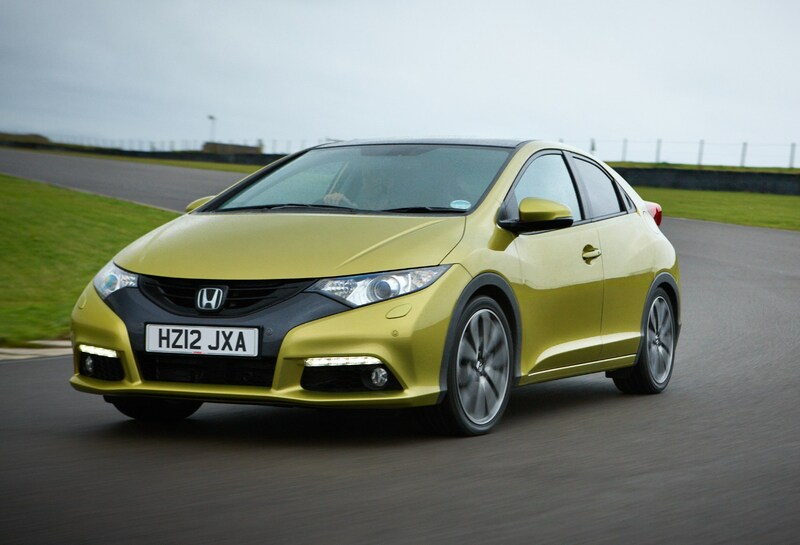 The suspension is firm but pliant and in terms of ride quality, the Civic's right up there with the best. 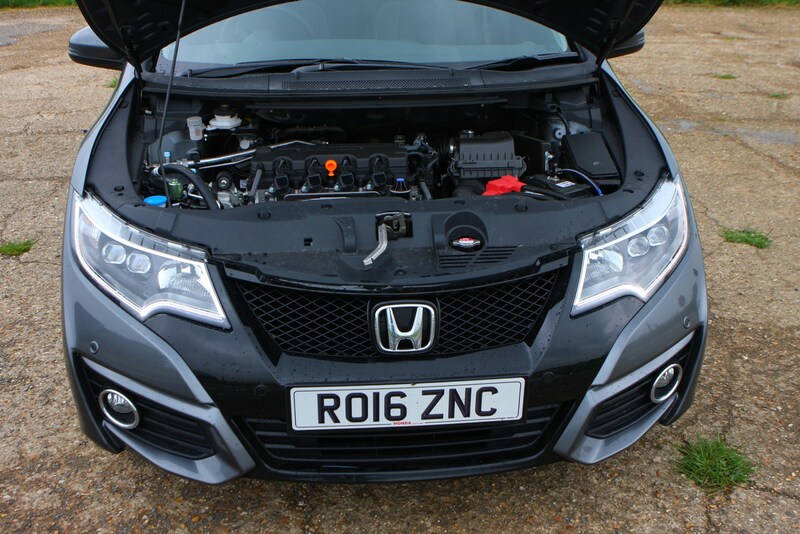 Engine noise has been well contained, particularly in the 1.8-litre petrol model, but there are certain areas in the diesel's rev range where things get a little intrusive. 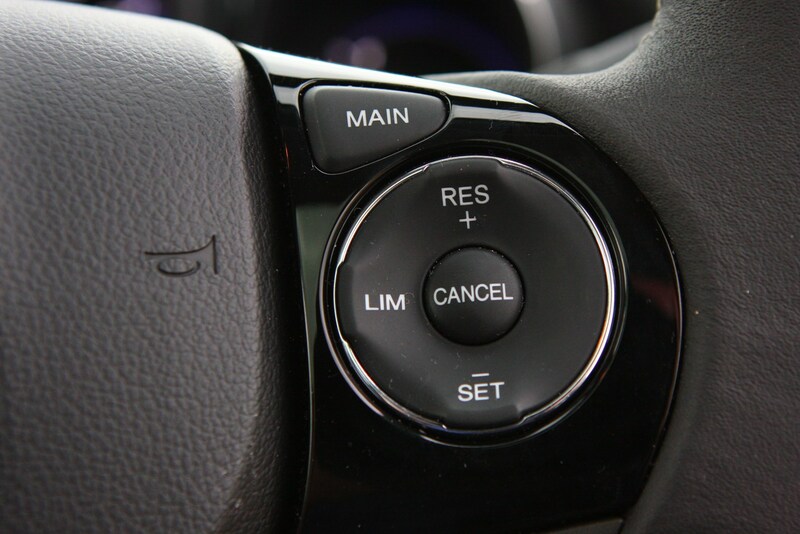 It's no deal-breaker though. 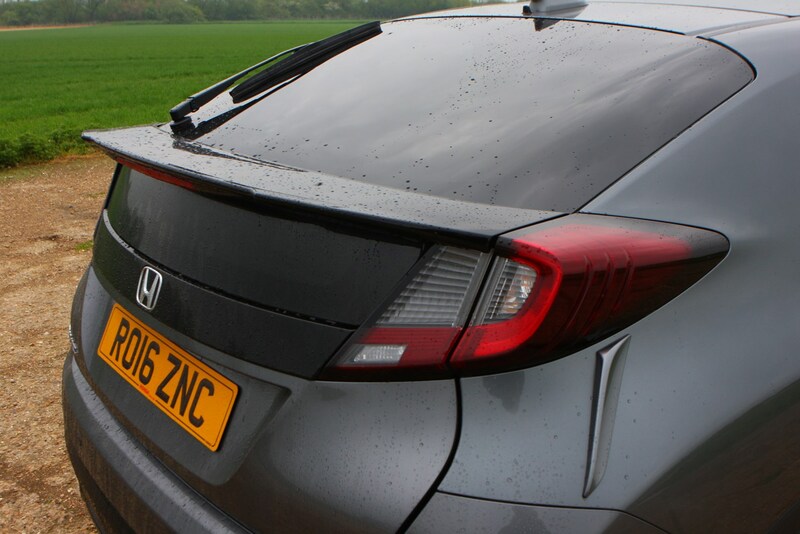 Wind noise is virtually undetectable, but on less-than-smooth road surfaces, expect some road noise.